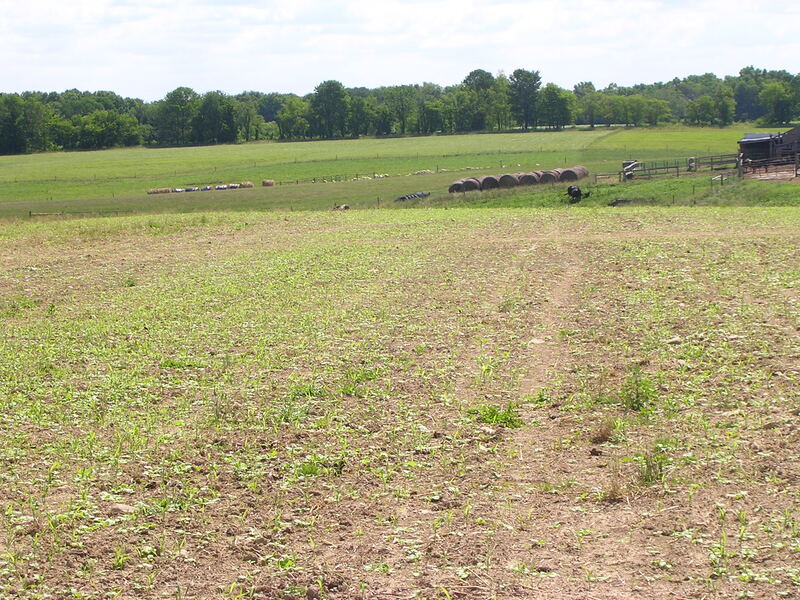 Weed problems may explode this year thanks to the drought of 2018 and residual problems associated with overgrazing in parched pastures, says University of Missouri Extension agronomist Valerie Tate. Row crop farmers are beginning to focus more on improving soil health on their land for long-term sustainability. 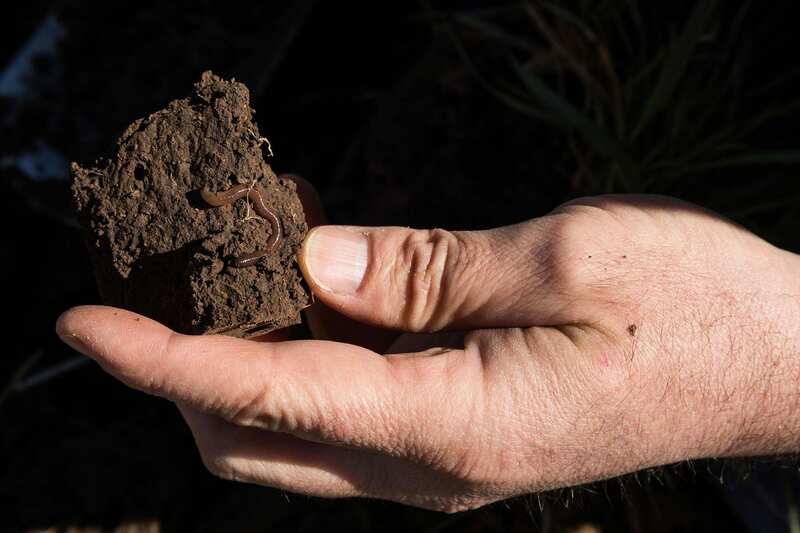 But according to USDA soil health and grassland specialists, livestock producers can also implement soil health practices to improve their pastures. 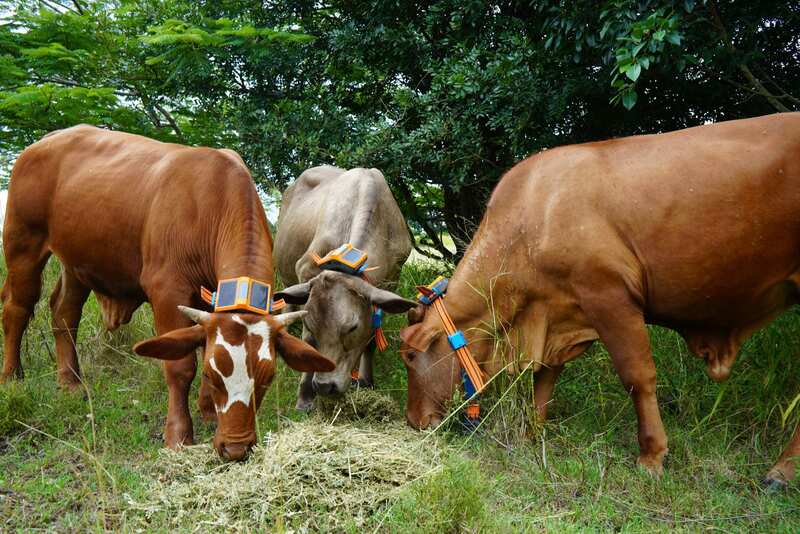 Although this article was written with the intent to serve dairy farms in times of need when feed resources are low, this information can easily be applied to any type of ruminant grazing system. 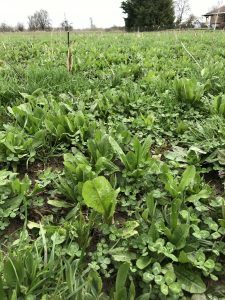 For those that are looking for ways to increase their forage nutritive value, a new species of quality forage to graze, or simply looking for something new to use, be sure to check out this piece on alternative spring forages that can be planted on-farm this spring! Success and long-term viability for most agricultural enterprises ultimately hinges on the health of their soil. This is true for beef operations in the Southern Great Plains to row crop farms in the Midwest. 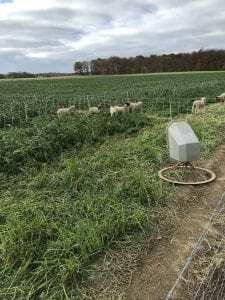 For those of you that followed us on Facebook (OSU Sheep Team) last week, you may have noticed that our postings were a bit different than usual. Over spring break I had the great opportunity to help lead the study abroad trip, Scotland Ruminants. Over the course of our eight day trip, 36 undergraduate Animal Sciences students and 3 advisors toured Scotland’s countryside learning everything from veterinary school opportunities at the University of Glasgow to ruminant production systems in Scotland which included the sheep, goat, beef, dairy, and for our pseudo ruminant friends, alpacas along with much more! 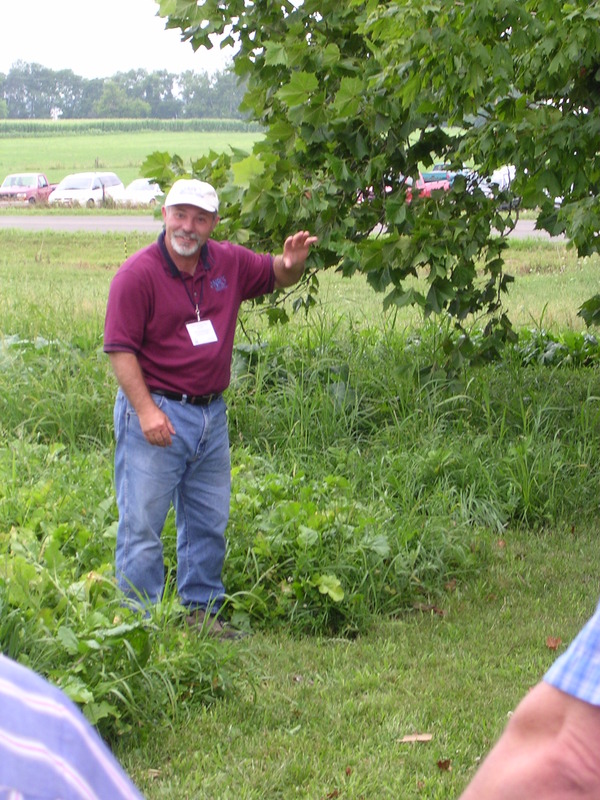 Forage stands will begin spring green-up in the next few weeks, especially in southern Ohio. 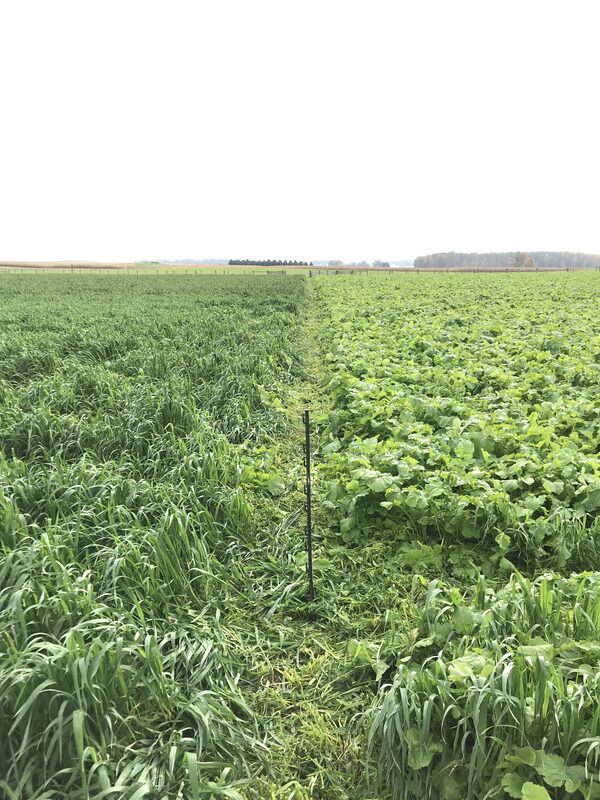 While winter injury in forages is very hard to predict, this winter has presented some very tough conditions for forage stands. This is especially true of legumes like alfalfa and red clover. 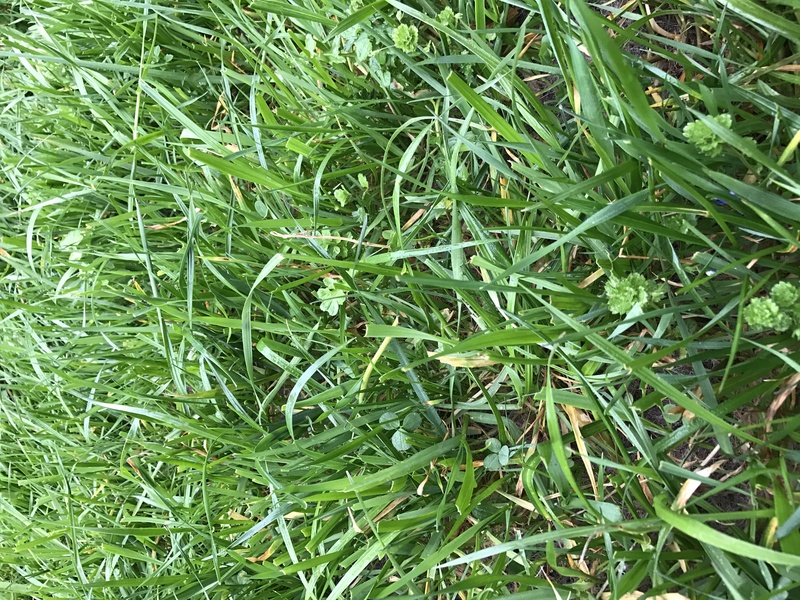 Producers and crop consultants should be prepared to walk forage stands early this spring to assess their condition in time to make decisions and adjustments for the 2019 growing season. Now is the time to capitalize on warm, early spring days. As the blanket of snow that covered the majority of the state throughout the winter continues to melt away, seedlings of perennial forages will begin to emerge from the ground, reflecting a hint of green across pastures as a reminder that spring is on the way. 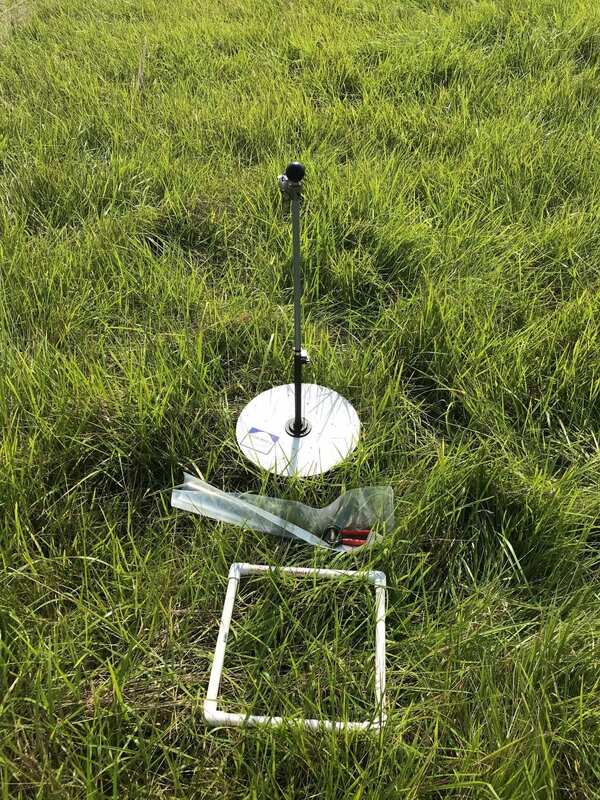 When planning to get your pastures ready for spring, the earlier the planning begins the better. When you are in the market for forage seed, get prepared before you drive to the co-op to shop. 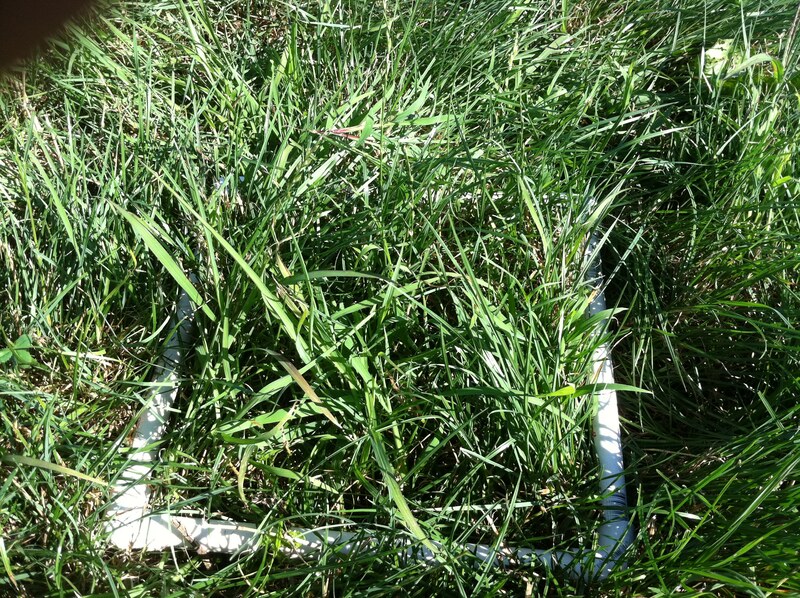 Variety is an influential factor in the success or failure of your forage stand. If you are not familiar with binomial nomenclature (the international language for naming plants), lets clarify the differences between species, variety, and cultivar, which are all terms you will encounter during seed selection. 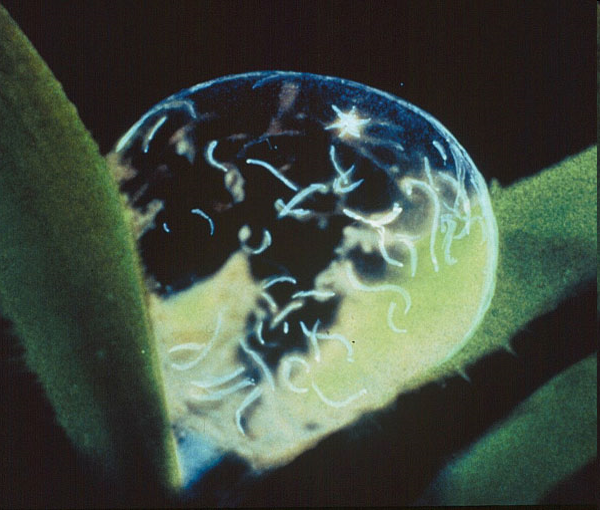 Nematode-trapping fungi have demonstrated potential as a biological control agent against the immature (larval) stages of gastrointestinal nematodes (worms) in livestock feces under both experimental and natural conditions. 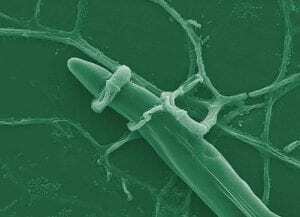 These fungi are normal soil inhabitants throughout the world where they feed on a variety of non-parasitic soil worms. 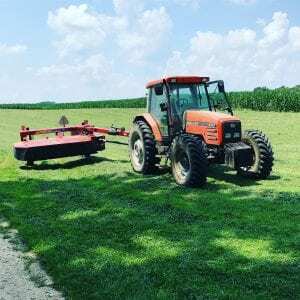 That saying “one man’s trash is another man’s treasure” usually does not apply to hay, but with as difficult as haymaking was in Ohio this year, it may be true. The “man” mentioned could be yourself in 2017 versus yourself in 2018. 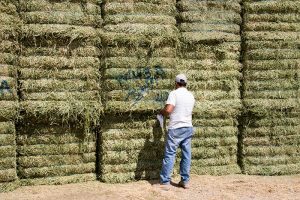 Based on what is available this year, you may be inclined to lower your standards of hay quality to make it through the winter. 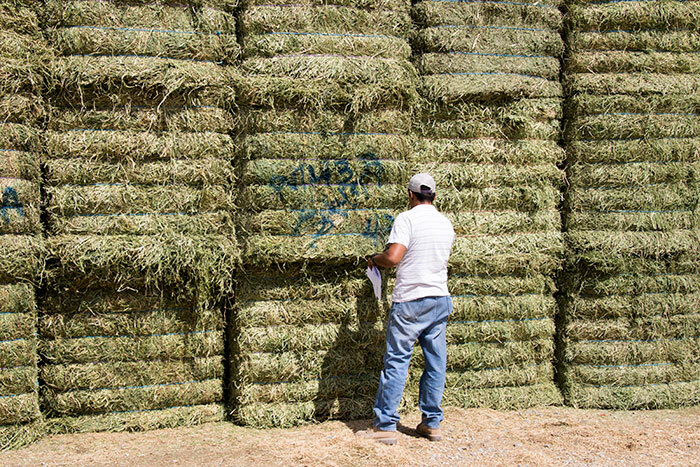 But, how low is too low when it comes to hay quality? The answer depends on your class of livestock, their nutritional needs, and your access to supplemental feed. With last week’s rain showers leaving much of the area saturated, there were limited opportunities for farming or even yardwork. I took advantage of the soggy conditions here in NW Ohio and headed south on Friday to a fairly productive couple of days in Morgan County. We had a good chance to winterize and store all of the hay equipment and tractors that we typically don’t use during winter time. Make plans for how to adapt for changes in weather. I mentioned last month that there are still plenty of good growing days left this fall and they need to be taken advantage of. One of the first things to do to make sure you obtain as much plant growth as possible, especially with perennial forages, is to stop grazing forages that will continue to grow for a while, especially forages that will stockpile like tall fescue. Now, I don’t think anyone would’ve predicted it would be almost 70 degrees the day before Halloween. I remember quite well going Trick-or-Treating as a kid with snow on the ground a few times. It’s not the same weather pattern these days, that’s for sure. Pulling this article from our achieves this week, it seems to be extremely timely and beneficial as mother nature has made it challenging to harvest crops this fall in a timely manner. As we progress later into the harvest season, stalk quality will decrease which could lead to more down corn in our fields. From a cropping standpoint, this is an issue as some of the downed crop may not be salvageable. Luckily not all is lost if we are able to incorporate a strategic grazing plan. Last week, we experienced our first frosts of the season in some areas of Ohio, but I don’t think anyone has experienced the real killing frost yet. 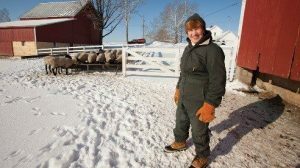 When some forages freeze, changes in their metabolism and composition can be toxic to ruminant livestock. The two problems that can occur are prussic acid (hydrogen cyanide) poisoning and bloat. First, I want to write about prussic acid or cyanide poisoning. Sorghum-related plants such as grain sorghum, sorghum-Sudan grass and Sudan grass varieties can contain toxic levels of cyanide after a frost. Johnsongrass, black cherry and elderberry can also develop toxic levels of prussic acid after a killing frost. 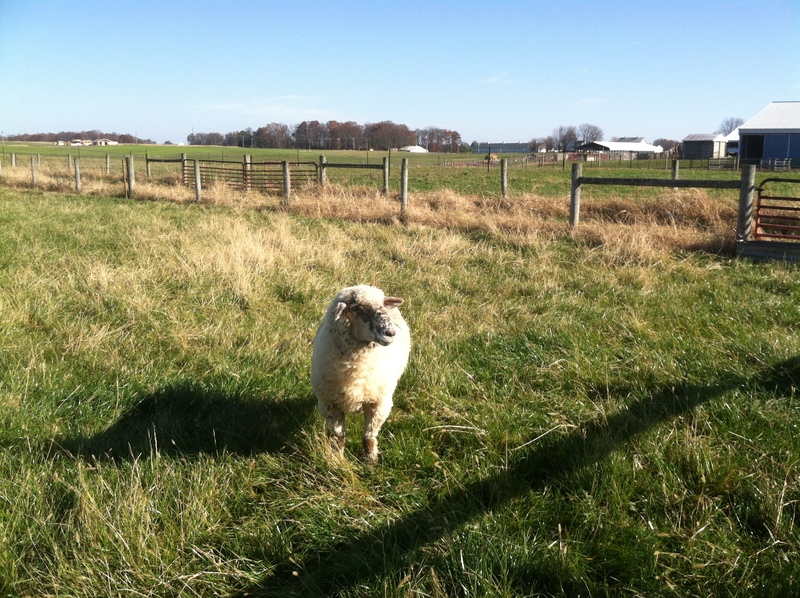 This past weekend I had a question from a sheep producer asking why he was loosing several ewes unexpectedly. Further into the conversation, he also mentioned that he figures on losing a dozen ewes during this time (fall) each year. My response to this was “has there been any instances of frost over the course of time that you have been loosing ewes and what types of forages are in your pastures?” Of course without visually seeing these animals and not having any lab work or even a field necropsy performed, it is hard to say what the exact cause of each case may have been. 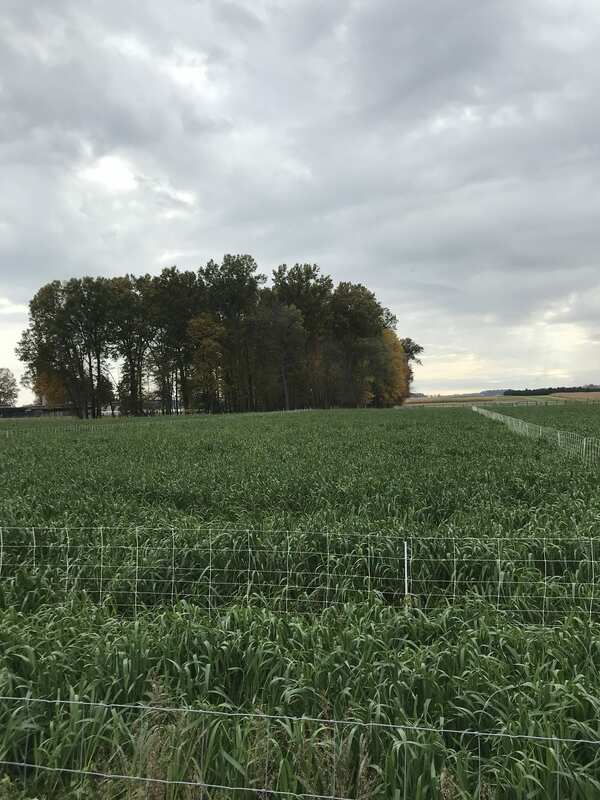 However, as we begin to move into colder temperatures with periods of frost and with producers potentially spreading manure prior to the winter months, it is important consider how these scenarios can affect plant species in your pastures. With this being said, the scenario listed above could have been the result of nitrate poisoning. To learn more about this issue with grazing livestock, check out this Q&A session provided by Mark Johns and Barry Yatemcio. How does nitrate get into the forage? 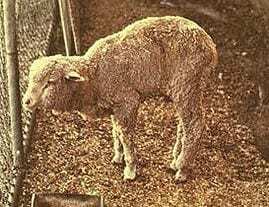 White muscle disease in sheep and goats. 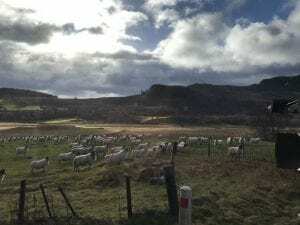 Stiff lamb disease – nutritional muscular dystrophy. If fescue is a problem on your farm, now is a great time to get it under control. I think it is good to start off talking about why it is a problem, how did it get to be a problem, are there some redeeming qualities, and finally, how to get it under control if it is a problem. Why it is a problem? As we move into the fall season, how much longer will your livestock be able to graze forage from your hay and pasture fields? 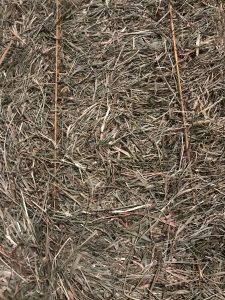 Have you prepared stockpiled forages? Are you able to utilize your livestock to take that last growth of forage off your hay fields rather than using equipment? Not using equipment to make a last cutting of hay, not having the livestock in pasture fields right now and not feeding hay for a while yet seems to be a winning combination all the way around. Fall is an excellent time to manage biennial and perennial weeds. 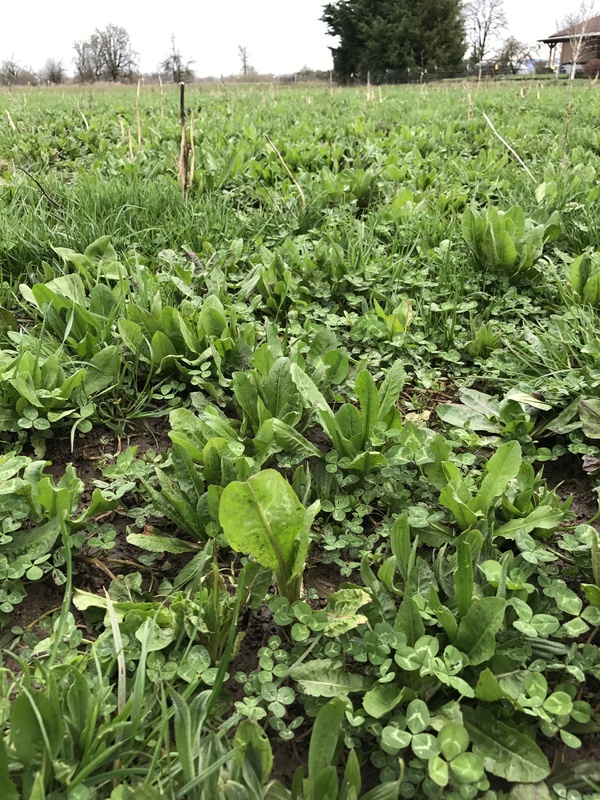 In particular, biennials such as common burdock, wild carrot, and bull, musk, and plumeless thistles are much easier to kill while they are in the rosette stage of growth, prior to surviving a winter. Once biennials start growth in the spring they rapidly develop with the goal of reproducing and it becomes more difficult to control them. 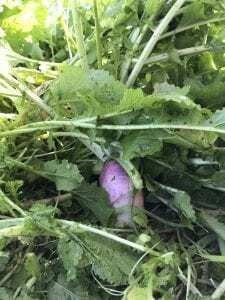 When Should You Harvest Small-grain Forage? Decide what you need between yield and quality, then watch those small-grain forages closely to harvest them at the desired growth stage. 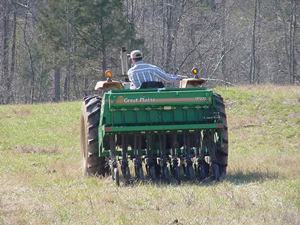 Farmers plant small-grain forages in two basic systems. One is as a nurse crop for a perennial hay crop such as alfalfa. A second is as a stand-alone annual forage crop. Harvest decisions depend largely on the system used. 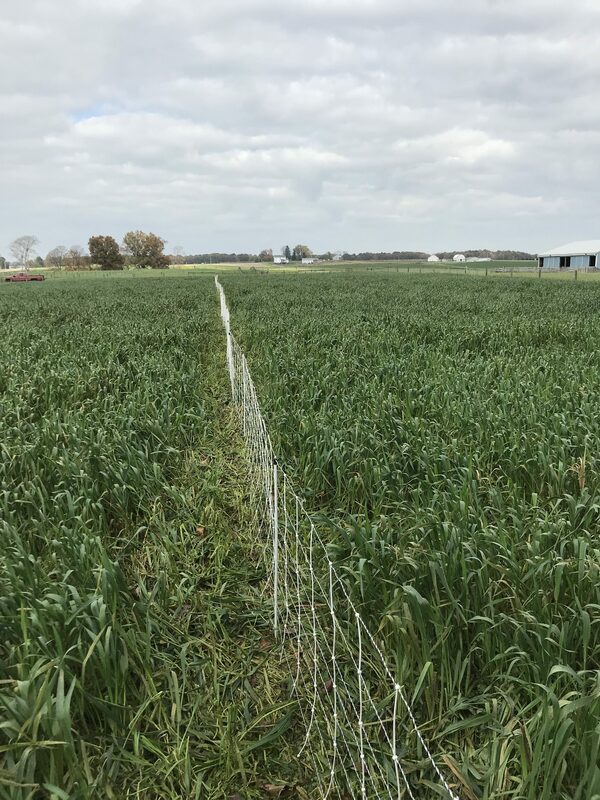 If the small-grain forage is a “nurse crop,” then the effects of the harvest decision are based on what is best for the perennial hay crop underneath. Leaving the nurse crop in place too long can create serious competition for the developing perennial hay crop. 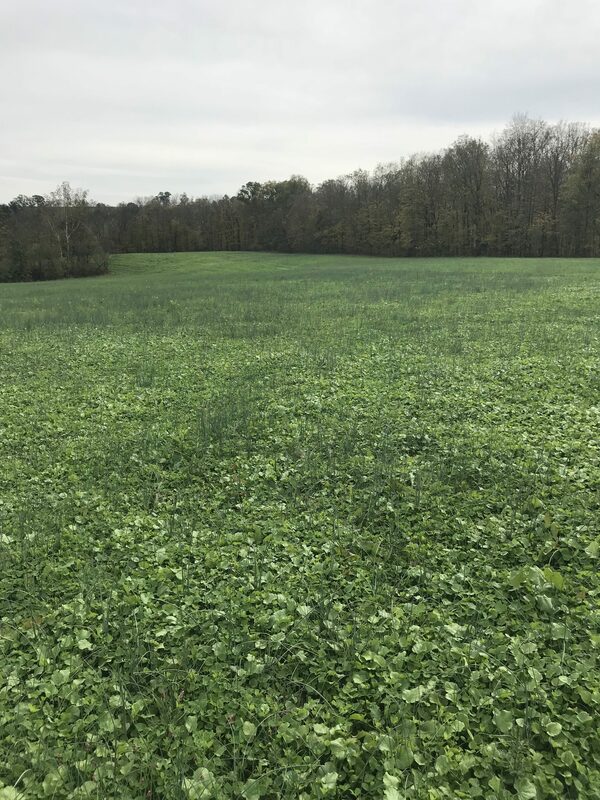 Drought and other weather maladies usually prompt the need for additional forage production in the fall and early spring. But even in a normal growing season, it often makes good sense to conserve stored hay supplies and plant an annual forage in late summer or early fall. 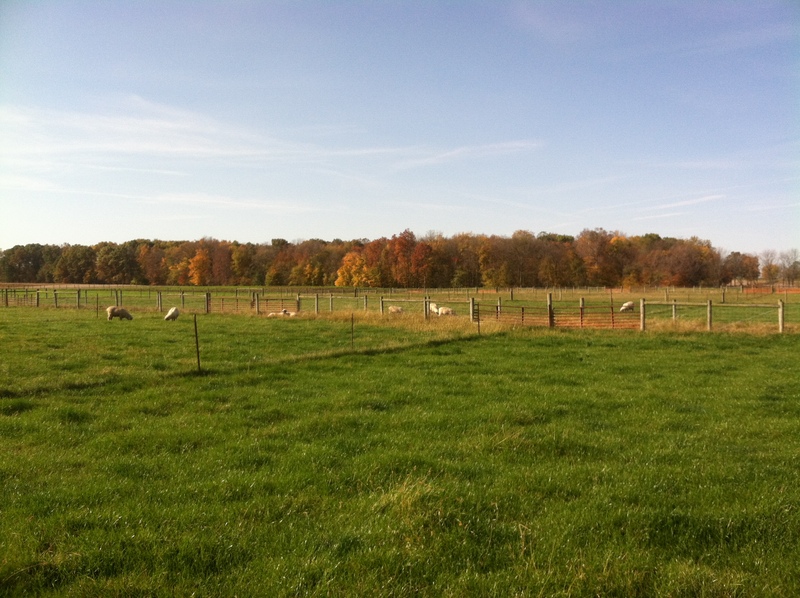 Fall pasture management is a critical period for pastures. 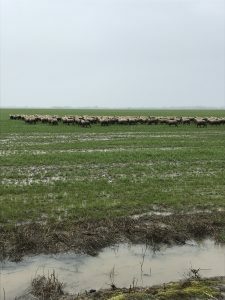 For many of us we have had adequate rainfall up until recently and pastures have done well to this point. As we transition into late summer and early fall it is critical to pay close attention to your forages. Some pastures may be stockpiled, but those intended to be grazed this fall still need time to rest. Mother Nature’s high-quality forage gift. 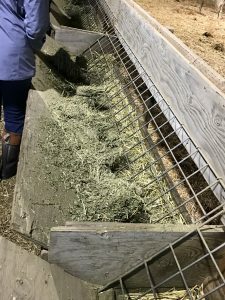 The end of July always marks a crucial time for forage producers, especially those with livestock mouths to feed and less than desirable forage inventories. 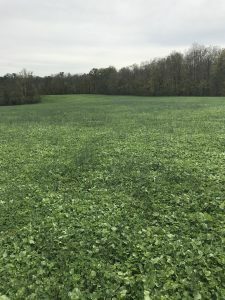 But then again, even if forage inventories are in pretty good shape, why would you want to pass on the opportunity to get some additional high-quality forage? 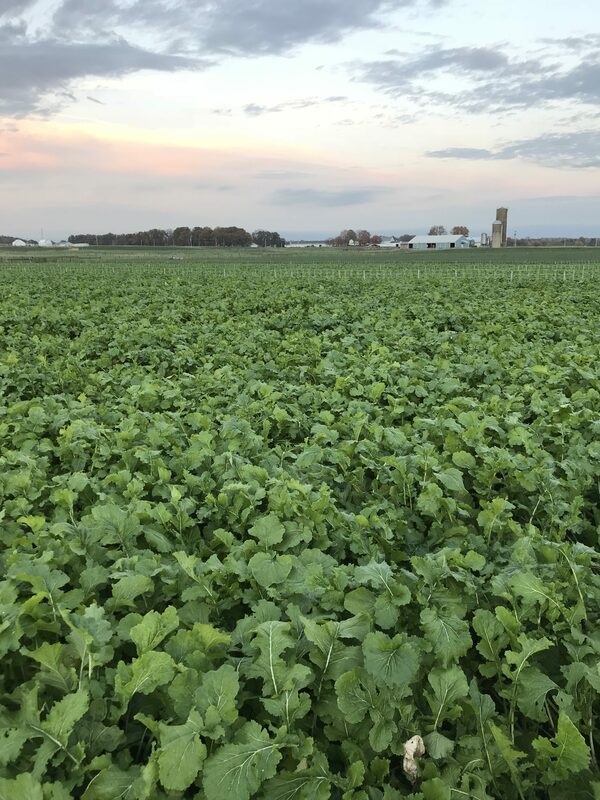 As recent changing forage-production trends go, seeding something in late summer for additional fall, winter, or early spring forage ranks high on the list. 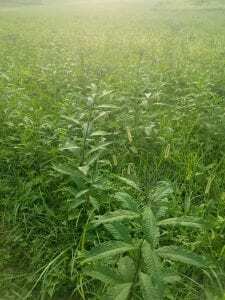 When temperatures begin to moderate in late August and September, it’s Mother Nature’s gift to have the opportunity for growing and/or harvesting some of the best forage of the season. Further, it can be captured in a variety of forms – hay, baleage, silage, or green. Ohio growers experienced another wet spring and compressed 2018 spring planting season. On some farms, this caused postponement of plans for spring seeding of alfalfa and other perennial forages. 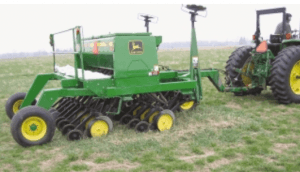 In some areas, the prolonged wet weather affected forage harvest schedules, resulting in harvest equipment running on wet forage fields leaving ruts, compacted soils and damage to alfalfa crowns. Some of these forage acres need to be re-seeded. Sometimes it’s good to stop looking at the vegetation in the road ditch and adjoining fields and direct your eyes toward the larger landscape. That’s what I intend to do here with the focus being on alfalfa. 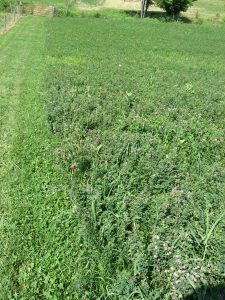 In essence, this will be something of a “State of the Alfalfa” dissertation with few specific recommendations, but some important concepts to understand if you grow and harvest alfalfa, or serve those who do. 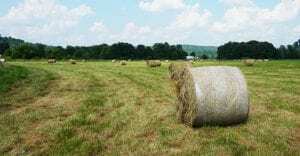 What is the nutrient content and quality of the hay? What are the nutrient requirements of the sheep? One of the worst practices we do, from a soil-health and productivity standpoint, is haying. 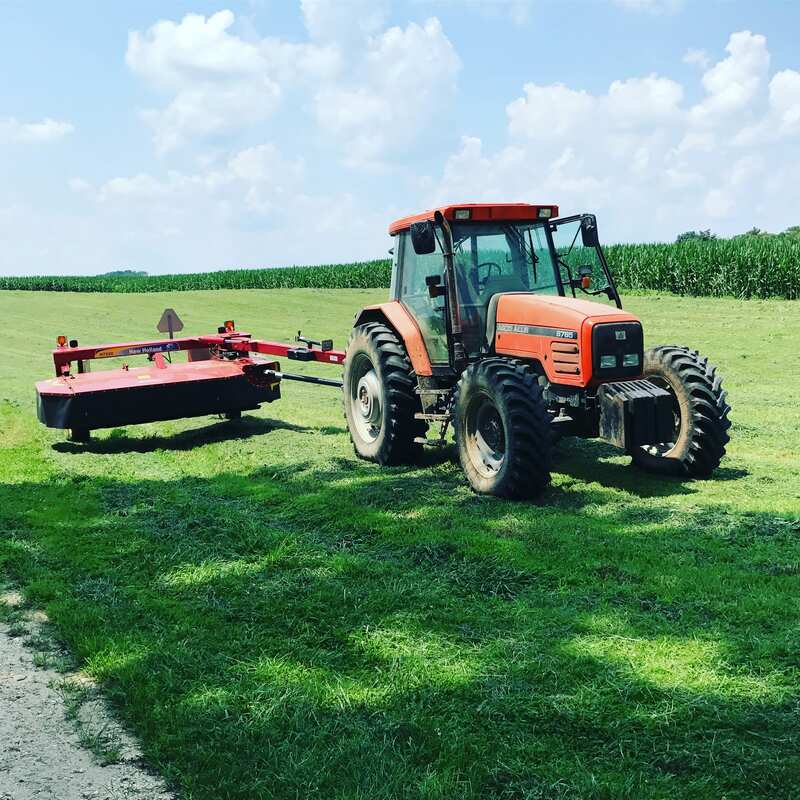 Haying generally removes significantly more nutrients from the soil than do grain crops, in addition to the damage it causes to soil life and the lack of biological stimulation. Examples from an Oklahoma State University publication generally match the data from other states. These are pounds of nutrient per ton of hay, so you can extrapolate this to a per-acre basis using your hay yields. 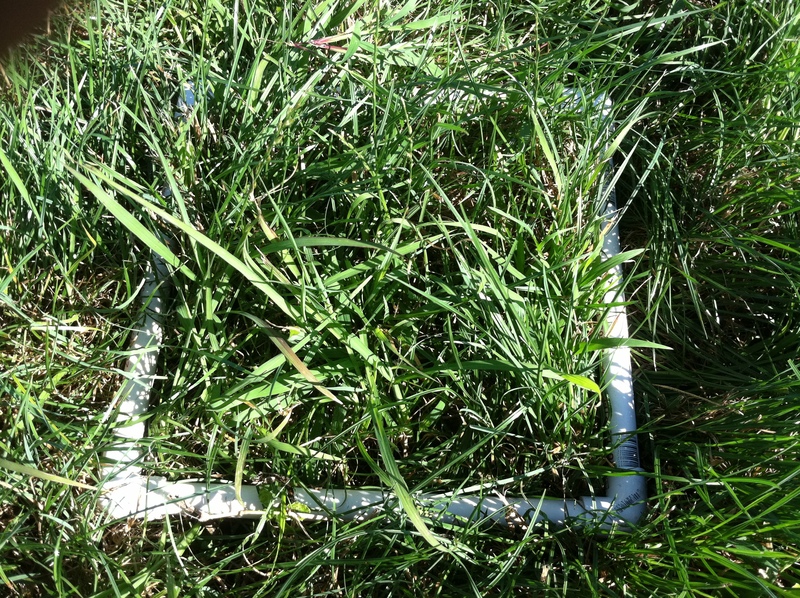 Tall fescue “Kentucky-31” (KY-31) is one of the most predominant forages in the nation. 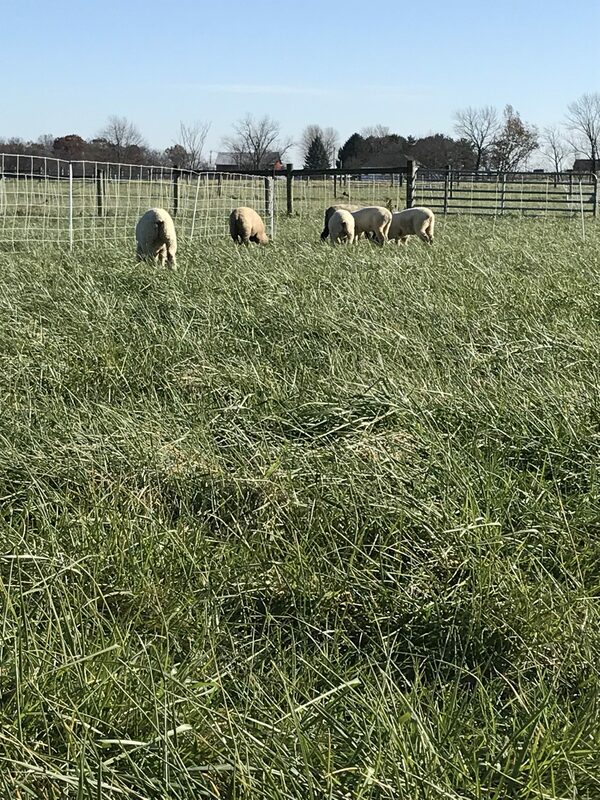 Its popularity began in the 1930s when a wild strain of fescue was discovered on a Kentucky farm and it became recognized for wide adaptability. In the1940s, the cultivated variety was publically released and can now be found in most pastures in the United States. 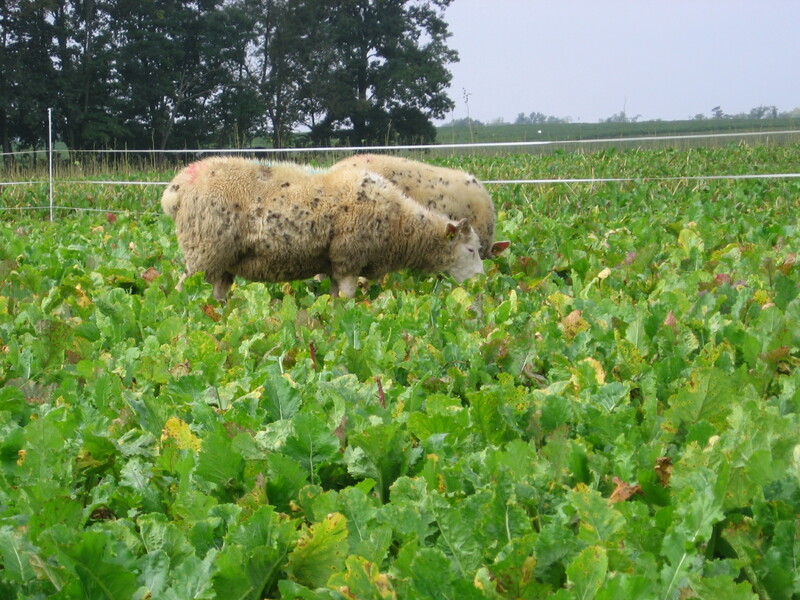 This cultivar is easy to establish, persistent, tolerant of many environmental stresses, resistant to pests, and can aid livestock managers in prolonging the grazing season. However, tall fescue does not accomplish all of these tasks unassisted. One of the many things that David Letterman gets remembered for is his Top 10 lists. These lists included such things as the Top 10 Signs Your Kid Had a Bad First Day at School, the Top 10 Numbers Between One and 10, and the Top 10 Dog Excuses for Losing the Dog Show (No. 3 – Didn’t know that was the judge’s leg). Lists, especially those that are ranked, are great for generating a plethora of discussion and arguments — just ask two passionate baseball fans to list the top 10 players during the past 50 years. It’s likely both will end their day in an emergency room. Agree or not, lists do invoke thought and reflection. 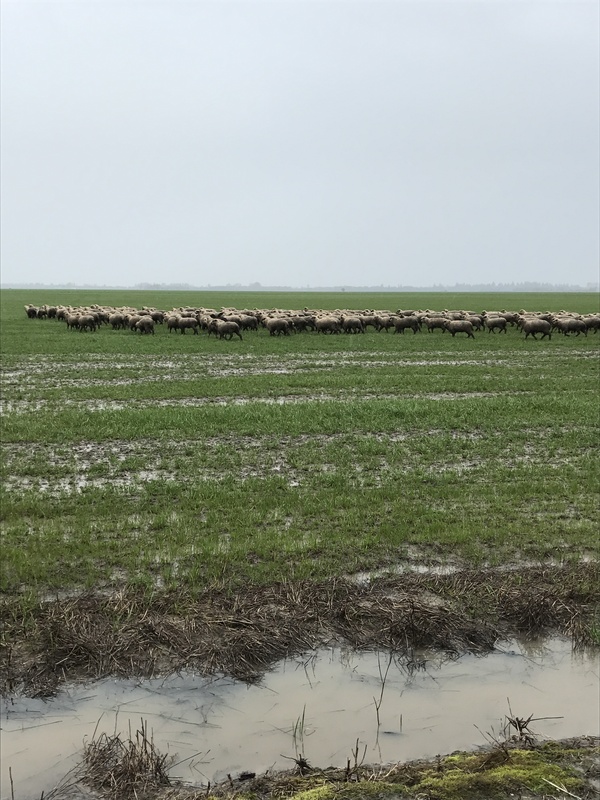 Mud, nutrient leaching, and erosion are a few of the ailments pastures across our region are experiencing in 2018. It can be challenging to be thankful for rain in years like this. 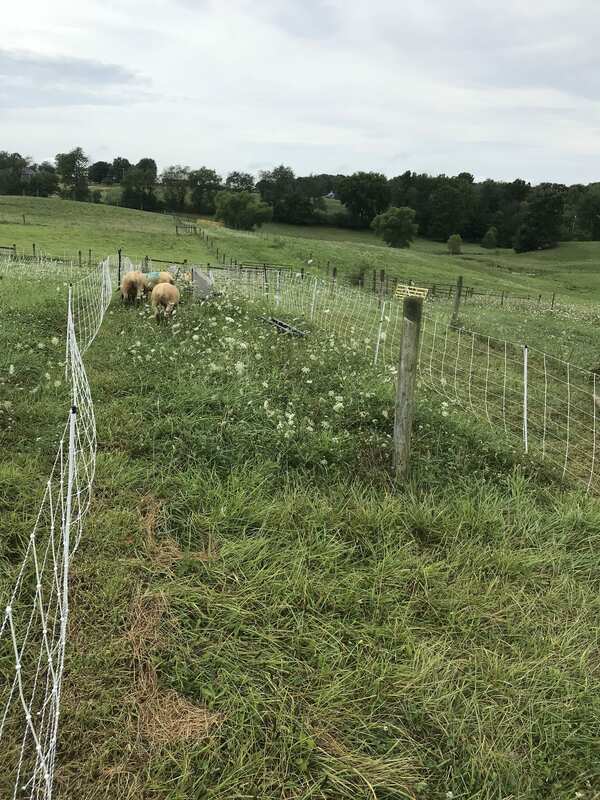 This year you have likely witnessed the rain wash away freshly planted seed, topsoil, and nutrients while trudging through swamps that should be access roads, watching seed heads develop on valuable hay, and cutting fallen limbs off damaged fence. Nature has taunted many this season. 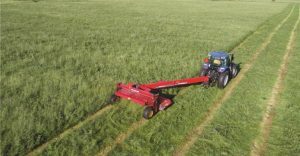 In Southeast Ohio, opportunities to make hay have been few and far between due to soggy soil conditions and high humidity. The longer harvest is delayed, the poorer nutritive value becomes. Most producers have probably harvested first cutting hay that will barely meet requirements for animal maintenance. 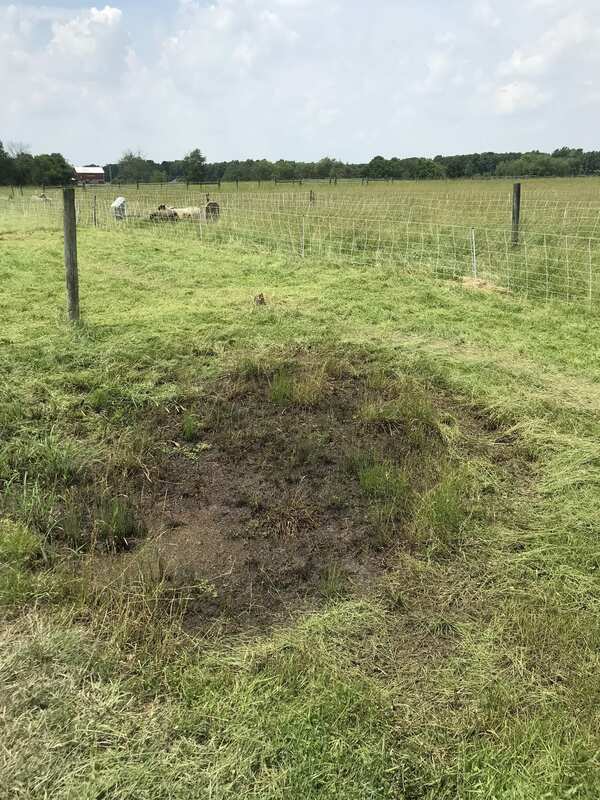 Looking beyond the frustration to solutions, there are things we can do to relieve the pressure that heavy rainfall inflicts on hayfields and grazed pastures. 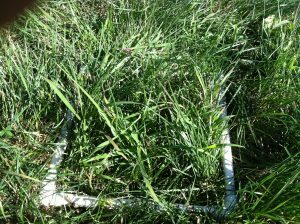 Multiflora Rose Problems in Pastures? Control it Now! 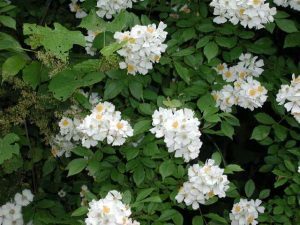 As spring progresses, multiflora rose aggressively grows and eventually blooms in late May/early June. Several tactics can be used to control this problem weed and these methods will be briefly discussed. 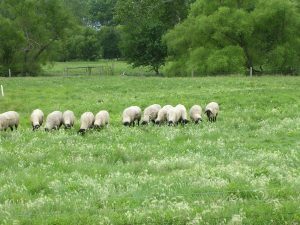 Summer annual grass grazing is a great tool for livestock operations. While it adds flexibility, management decisions are needed to make it worth the time and cost. Sorghum-sudangrass (sudex), sudangrass, pearl millet, foxtail millet, and teff are the most commonly used grazing summer annuals. 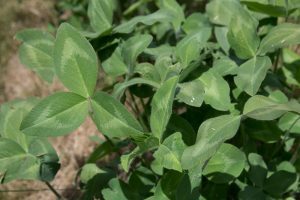 Brad Schick, University of Nebraska-Lincoln extension educator, offered some advice for utilizing summer annuals in a recent UNL BeefWatch newsletter. You could say there was a perfect storm coming into this spring. The combination of wet weather, cool temperatures, and less growing degree days has led to slow pasture growth. 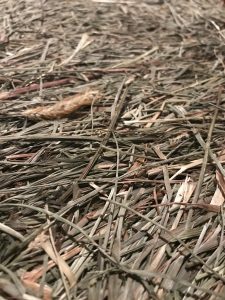 Low hay stockpiles have compounded the problem. Dealing with crappy new seedings. That “it” is to walk a new forage seeding field that just never developed. 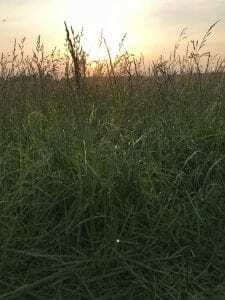 There is nothing more disheartening than a newly seeded hayfield or pasture that for one or a variety of reasons was done before “it” ever really started. During my extension agent days, I walked many of these fields. Sometimes the failure could be blamed on the weather, but there were cases when the reasons for the lack of establishment just couldn’t be fully explained. Across the U.S., acres of grass are being harvested for hay with a majority destined to be stored as bales for winter forage. 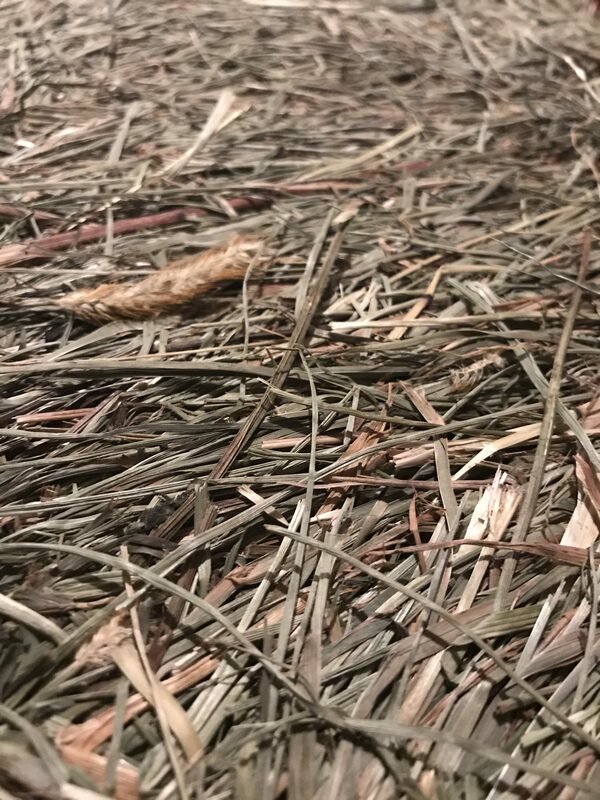 This hay must be able to provide the necessary amount of protein and energy to fulfill the nutrient needs of the [animals] that will consume it. But all hay should not be viewed as equal as it varies in nutrient content due to multiple factors. Full disclosure — I am not an economist. 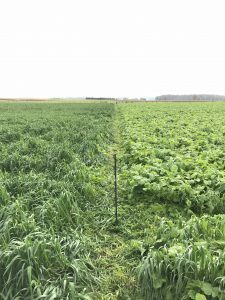 However, my premise is this: For various reasons, many growers would be economically better off growing a different forage than what they have always grown. 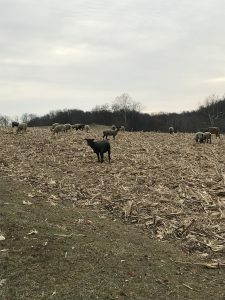 Adaptive grazing is a term describing a management approach that includes many practices such as frequent rotation of cattle and stockpiling for winter grazing. It is not a recipe; it is a very flexible system that producers can modify to fit their needs and skills. 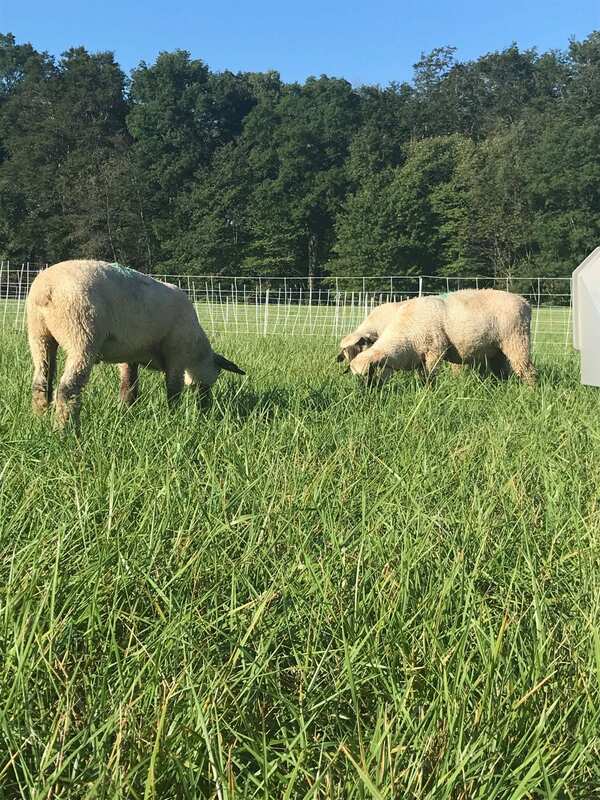 In North Carolina, our educational program “Amazing Grazing” strives to teach principles and critical thinking skills, so producers can begin adaptive grazing. 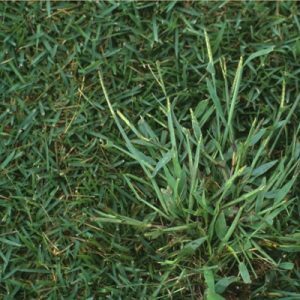 Does Crabgrass Really Hate You? You may have heard the rumor that crabgrass (Digitaria sanguinalis) hates you. Those who profit from the sale of lawn care products may like you to believe that, but despite the claims, it really isn’t true. 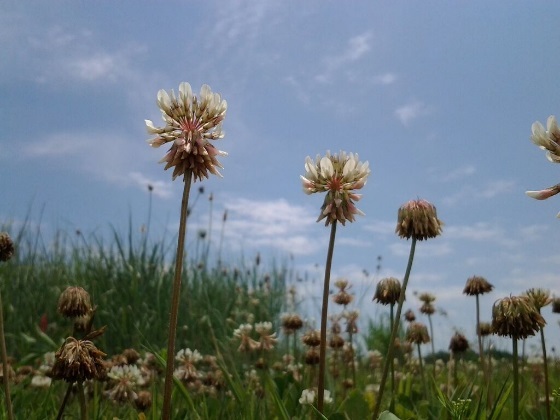 Each year crabgrass works toward accomplishing the goal of all living things, to reproduce, and if it had a life motto, it might be something like “Life is short, so live it!” Any plant out of place can be considered a weed and in the eye of many, crabgrass fits this description. 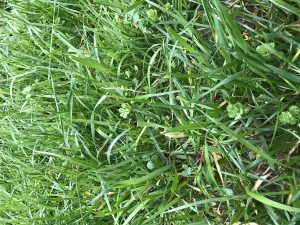 However in a forage system, crabgrass can be the right plant, in the right place, at the right time. It’s true for fescue, too. 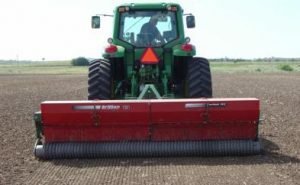 Volumes have been written about the importance of cutting alfalfa on time. Truth be told, it may be even more critical for grasses. 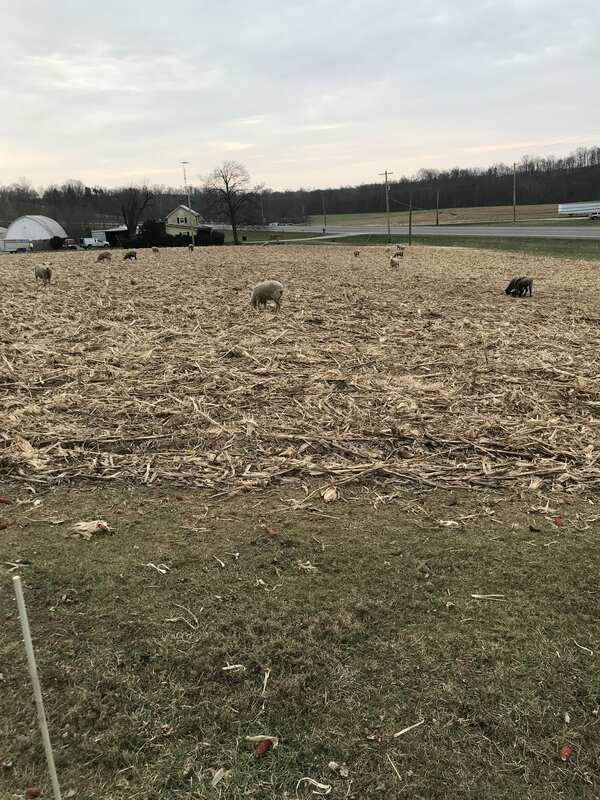 Jimmy Henning, extension forage agronomist with the University of Kentucky, points to research from the University of Tennessee that is a compelling example of how harvest timing drives future animal performance. He writes about the research in the most recent UK Forage News newsletter. Hay-makers have realized in recent years that wide swaths raise quality and finish faster. Laying down hay in the widest possible swath speeds drying, improves quality and probably saves money in the long run. 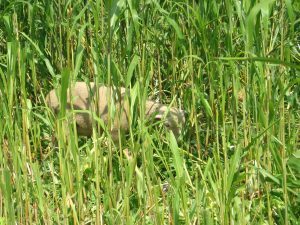 When Should Pastures be Mowed? The spring of 201 8 was the latest I can remember feeding hay to my cattle, and many producers were searching at the last minute to find some extra hay. Pastures were very slow growing this spring until it finally warmed up in early May. On my farm, common orchardgrass typically starts heading out in late April, and it was two weeks later this year. 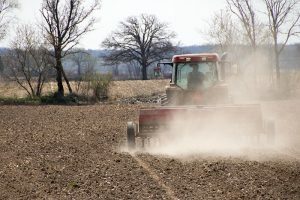 The late-arriving spring brought many challenges around farms, and the rush to get crops in the ground and to make hay has put mowing pastures on the backburner. However, now may be a great time to mow pastures. 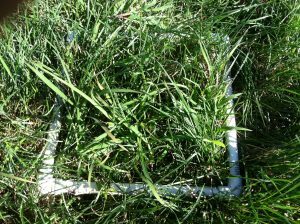 Tall fescue and its endophyte – implications for your farm. This time of the year most of us are waiting for winter to end, looking forward to warmer temperatures and greener pastures. Very few people woke up this morning thinking about drought. Is it Time to Start Grazing? For the spring we are having, and each producer’s situation, this is a difficult question. However, for most of us, the answer is yes! The recent warm weather has allowed the pasture and hay fields to really start growing at a fast clip. I meet a lot of people at forage meetings during the course of a year. Never has anyone broached the subject of sericea lespedeza . . . that’s until I met Reed Edwards at a Georgia hay conference in 2016. Edwards is one of those farmers who is not afraid to move outside the box of accepted practices or try whatever the latest extension recommendation might be. Either way, he’s going to forge his own path. Winter has come and gone, and despite the many scares Mother Nature provided, and the well-in-advance warnings by local weather stations around the state, many of us chose not to rush out and stock up on break and milk. And miraculously, we survived. Hopefully, all of your livestock, with the proper planning and nutrition, survived the cold snaps and snow storms as well. Pasture-based livestock production at first glance is a simple system. 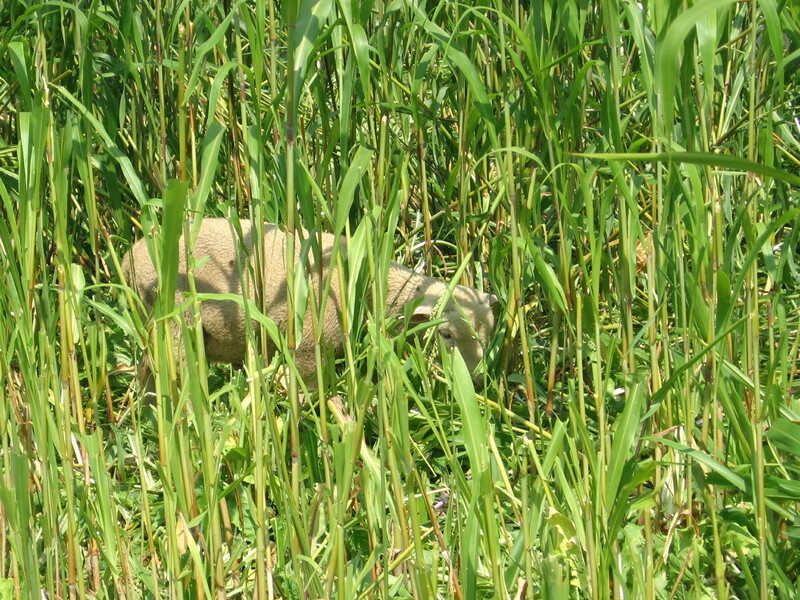 Producers use herbivores to harvest forage and create something they can sell (or enjoy). 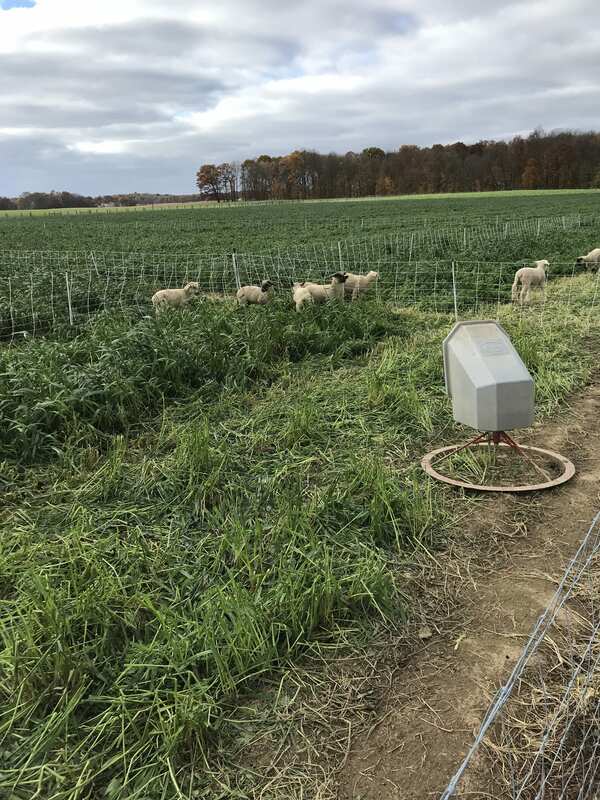 In the past, it has been typical to use a continuous grazing system where livestock will remain on the same pasture for an extended period, but this can lead to poor forage utilization. 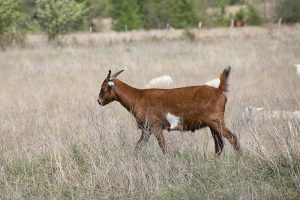 Livestock will roam large pastures as they seek out their preferred plant species and leave others to become degraded, mature, and unpalatable. Cattle, horses, sheep, and goats are all susceptible to internal parasites, which can be devastating to producers economically. 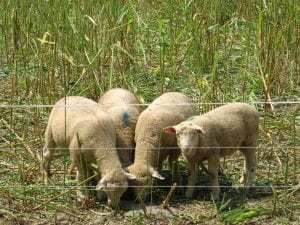 “Many times, the effects are subclinical and may go unnoticed, but severe infestations can cause disease and death,” says Adam Speir, a county extension agent with the University of Georgia’s forage extension team. How Often Should You Cut Alfalfa? Most dairy producers are fairly aggressive with alfalfa cutting schedules. 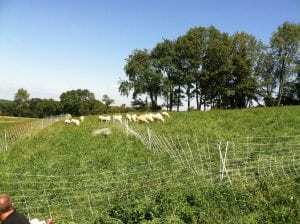 Their goal is to achieve high-quality forage. 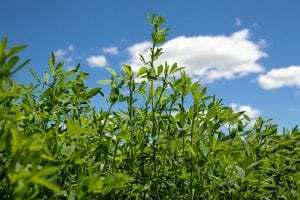 But cutting too frequently usually shortens the life of alfalfa and often gives lower yields, even when more cuttings are taken per growing season. 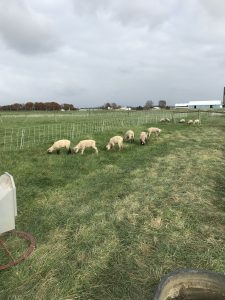 I had a conversation recently in which some common mindsets that interfere with profitability in livestock operations were brought out. 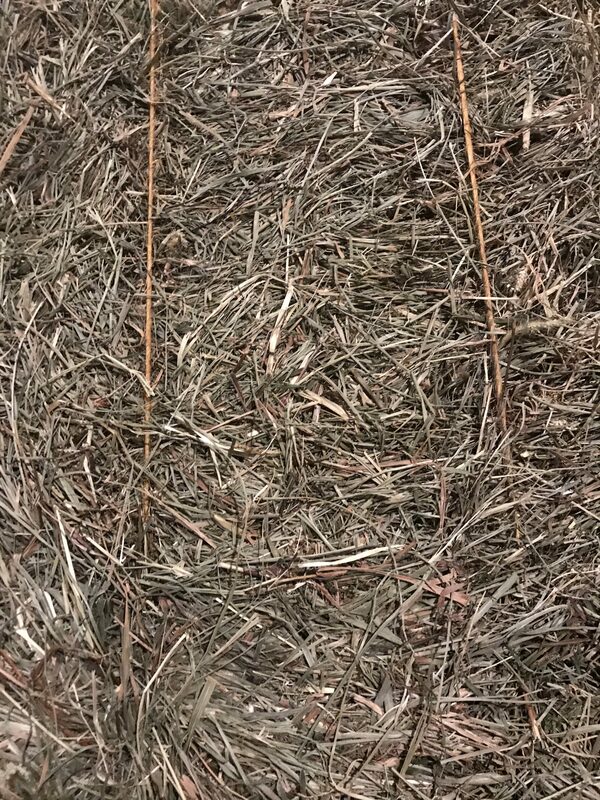 In the February issue of Hay & Forage Grower, I shared a story about Reed Edwards, a South Carolina farmer who had been growing sericea lespedeza hay for about 10 years. Edwards sold his hay about as fast as he could make it, mostly to customers with Boar show goats or dairy goats. Forage Corner: Here is advice to help you make the best first-cutting hay possible. Making quality hay can be difficult any time of year. First-cutting hay can provide extra challenges, largely due to weather and other time demands early in the season. Here are eight tips that help me do the best job I can in making first-cutting hay properly. As alfalfa stands age, they become thinner. 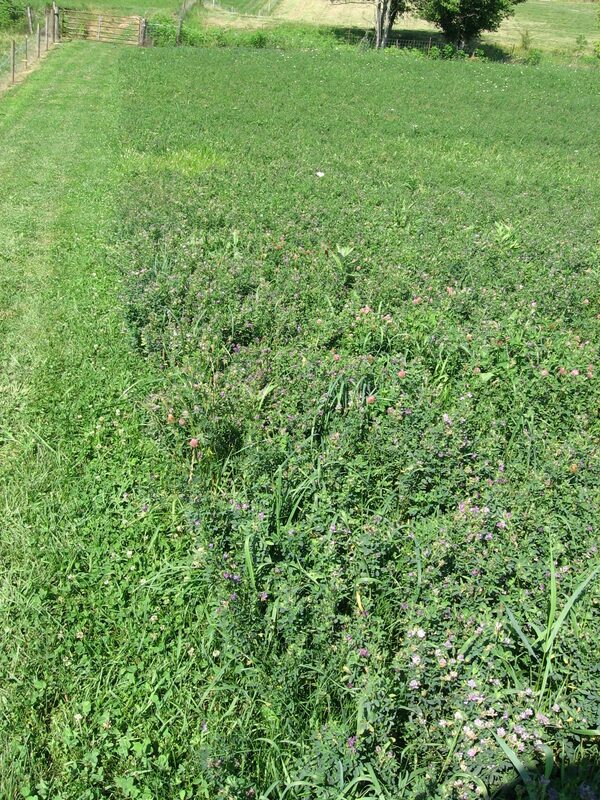 The thinner alfalfa population allows weeds to encroach the field. 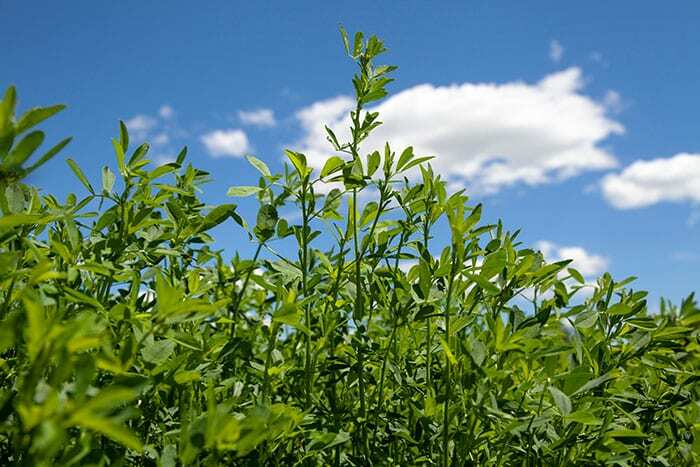 Weeds can also be a problem if weeds were not properly managed prior to seeding the alfalfa. 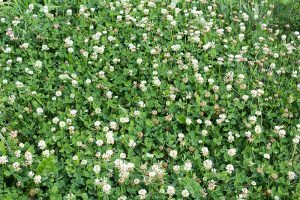 After the establishment year, the weeds that are most frequent in an alfalfa field are winter annual weeds such as common chickweed, henbit, purple deadnettle, shepherd’s-purse, field pennycress, yellow rocket, birdsrape mustard, bushy wallflower, and cressleaf groundsel. 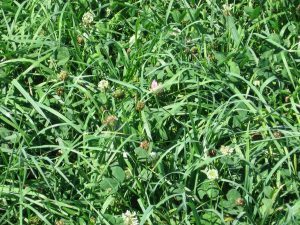 As we begin to move into spring, we need to start thinking about spring forage growth and how we will be managing our pastures over the course of the new year. 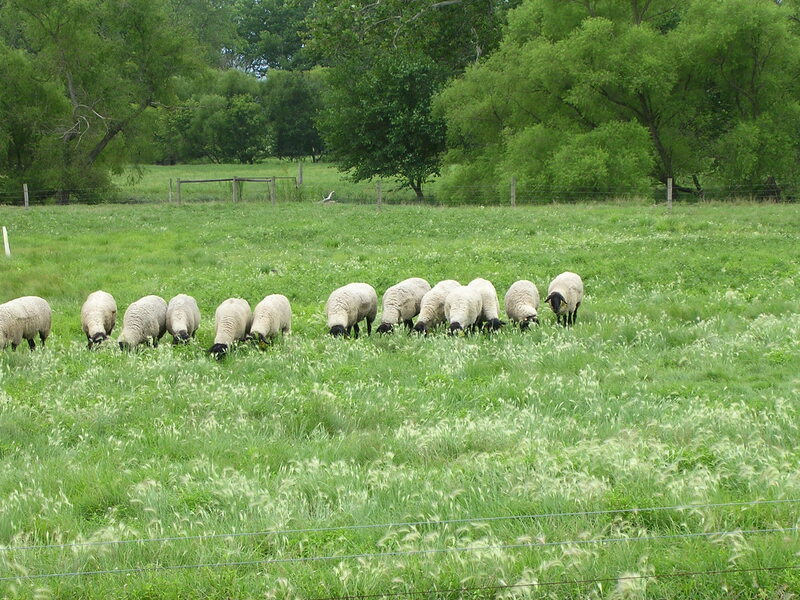 Pasture management is very important for grazing animals; cattle, horse, llama, and sheep owners. By managing pastures more effectively, land managers can increase forage production, lower production costs, improve aesthetics, and promote a healthier environment. The benefits of a well-managed pasture include reducing environmental impacts of your operation, including movement of soil and manure to water bodies; improving property aesthetics, which makes for good neighbor relations, and increases property value; and providing feed and recreation for your horses. Using a rotational grazing system can enhance these benefits. I know that you all may be thinking, “how many times are we going to read about frost seeding this year?” However, I have always been taught that repetition is the key to learning. In addition, I found this piece interesting as it highlights some alternative frost-seeding methods from our very own Mr. Wayne Shriver, farm manager of the Eastern Agricultural Research Station in Caldwell, Ohio. I encourage you all to take a look and see what information Wayne and the others have to offer. Eight things to remember about soil and livestock health and improvement. I don’t know about ya’ll but I spend a right smart amount of time planning to do better. I am so well organized that it is often a relief when my flip phone rings so I can find it. 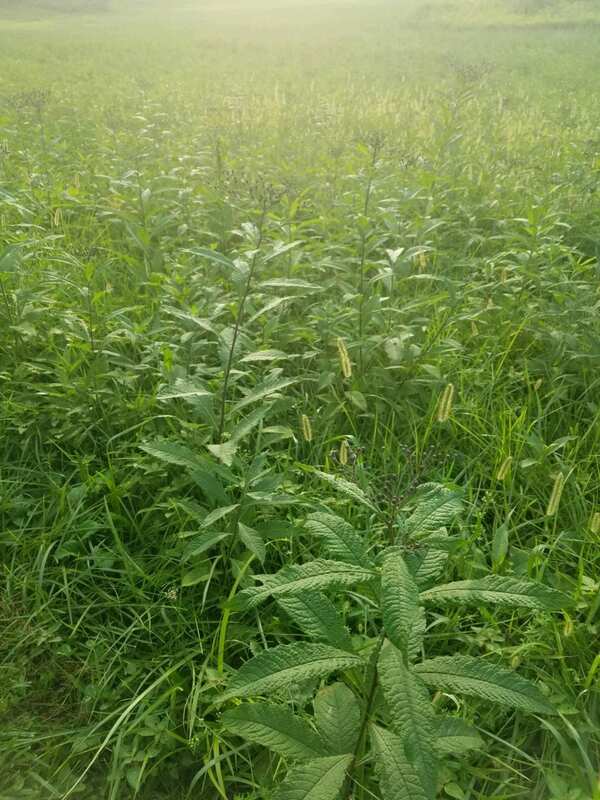 Gone are the days when warm-season weeds seemingly had a corner on the warm-season pasture market. 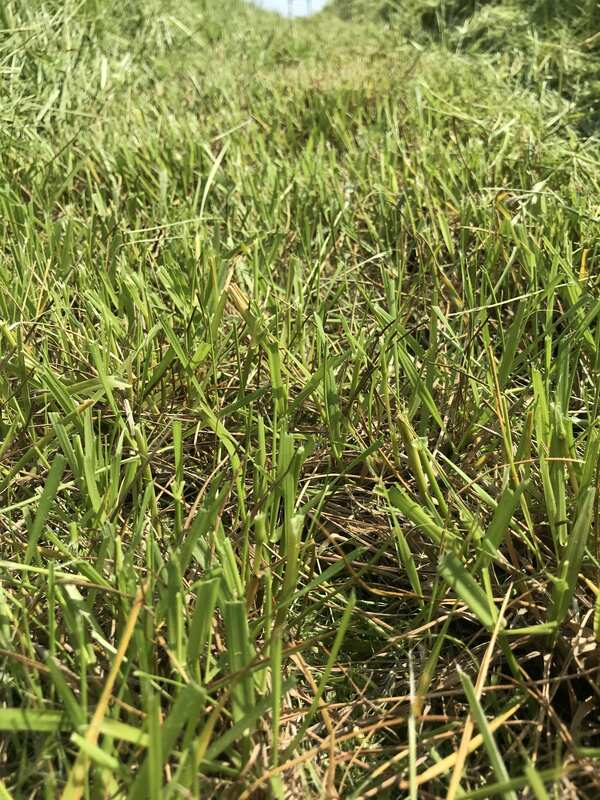 Producers who typically focus their control efforts on warm-season broadleaf and grass weeds, such as ragweed, broomweed, sandbur, or johnsongrass, may want to broaden their efforts. Oats, barley, triticale, and spring wheat all make for good grazing and hay crops when they are spring-seeded. 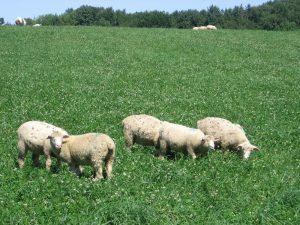 For a seed cost of between $25 and $31 per acre, livestock producers can gain valuable grazing days or hay by planting cool-season annuals in the spring or fall. All kinds of annuals can be planted in the spring, according to Nebraska Extension educator emeritus, Dennis Bauer. 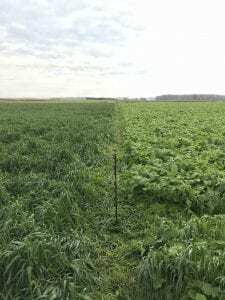 Speaking at a Beef Profit Tips meeting in Center, Neb., recently, Bauer said oats, spring triticale, spring beardless barley, Italian or annual ryegrass, field peas, and other legumes all make good grazing or hay options. 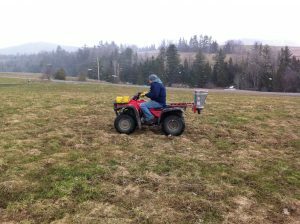 This is the time of year when farmers will want to think about re-seeding their pasture and hay fields. This method of seeding is called “frost seeding” which is where you apply seed to the ground and the freezing and thawing of the soil in February and early march will provide seed to soil contact allowing germination of the seed. There is a little more risk of the seed not germinating than with a “traditional” seeding, but the cost and time is a lot less. Do Sheep and Goats get Cold? 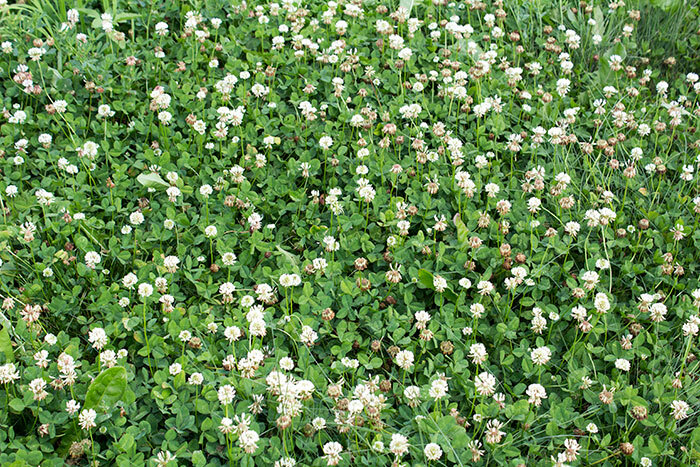 In the various humid regions across the United States, clover species bring a commonality to the miles of separation. 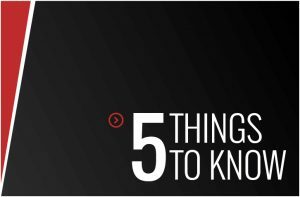 Their adaptability to a variety of soils and growing conditions makes them a foundational component in many forage systems. Yet, most forage experts would say that they remain vastly unappreciated and underutilized. New Year’s Day has come and gone, as have some of our New Year’s resolutions: eat less junk food, go to the gym more often, lose weight, and the list goes on. 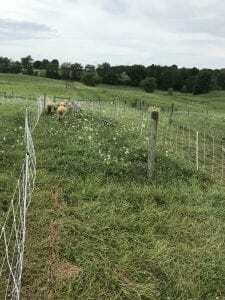 I hope our pasture management goals for the year last longer. 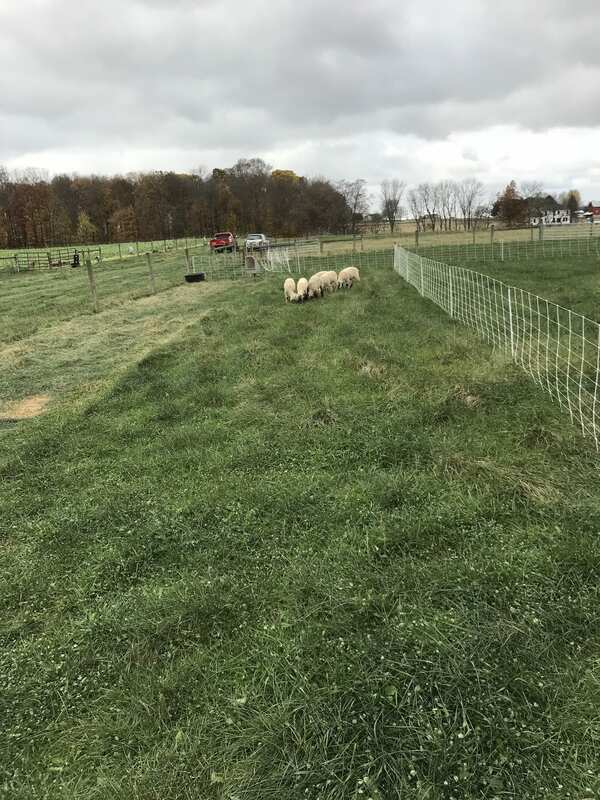 As I contemplate the projects I have completed and those that are still on the list for another year, I think about how I can get more production from my pasture or how I can feed more animals on the same amount of land. 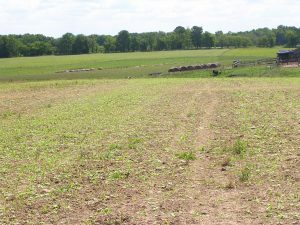 Should I Add More Legumes to My Pasture? 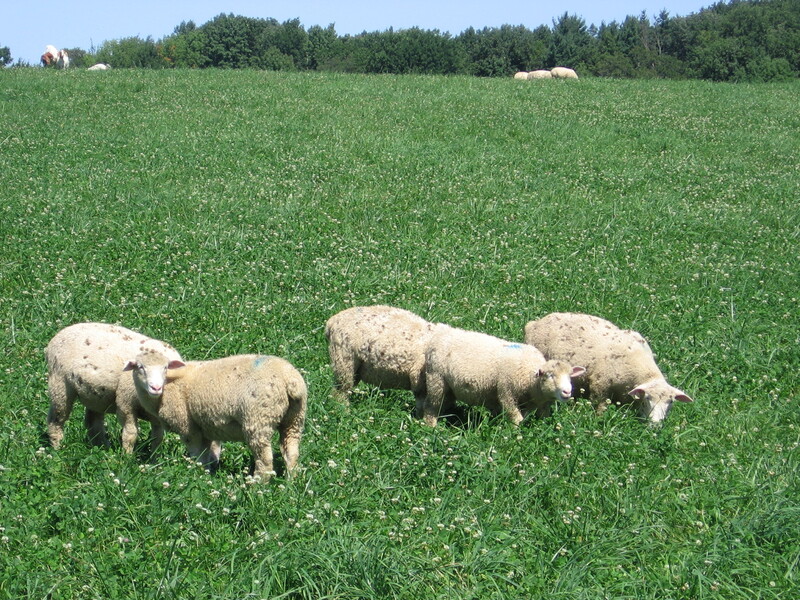 Including legumes in grass pastures has the potential to increase the overall nutritive value of the pasture and decrease the need for supplemental nitrogen fertilizer. 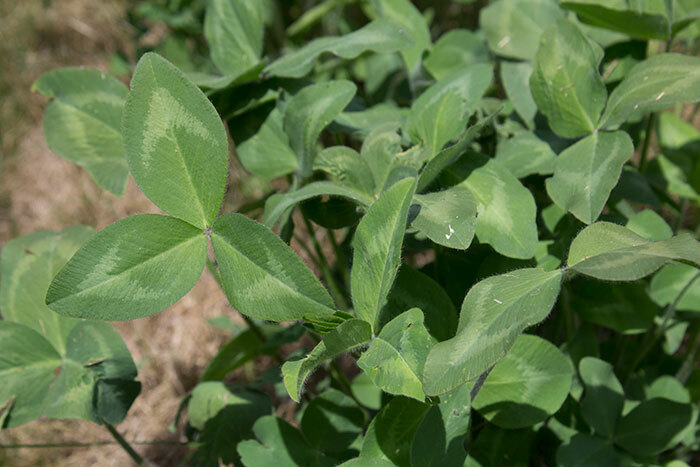 Read on to find out if you should add more legumes to your pasture. What is so special about legumes? As the new year begins, most Ohio graziers are probably feeding a good portion of hay as a part of their animals’ daily ration. Even if there is a supply of stockpiled forage available, we tend to make hay available just in case they need a little extra. It is likely that grain is also part of that daily ration. Well, how do you know how much hay, grain, and pasture they need? No one wants to leave their animals hungry. In addition, we do not want to waste time or money with unnecessary feeding. Figuring out the balance can seem like a guessing game, but the place to start is with a hay test. 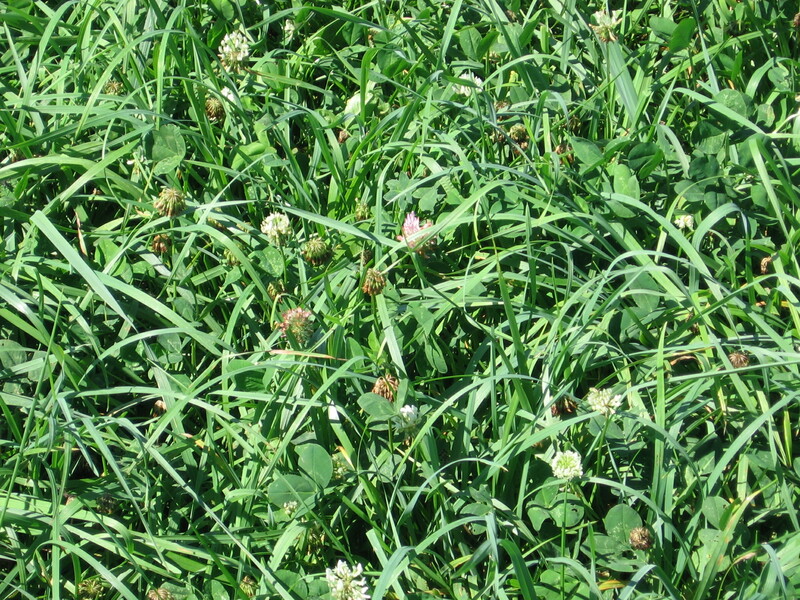 widely used strategy to bolster pasture productivity or add new species to the forage mix. Pasture fields, unlike many annual crop fields, are typically comprised of multiple species of grasses, legumes, and forbs. 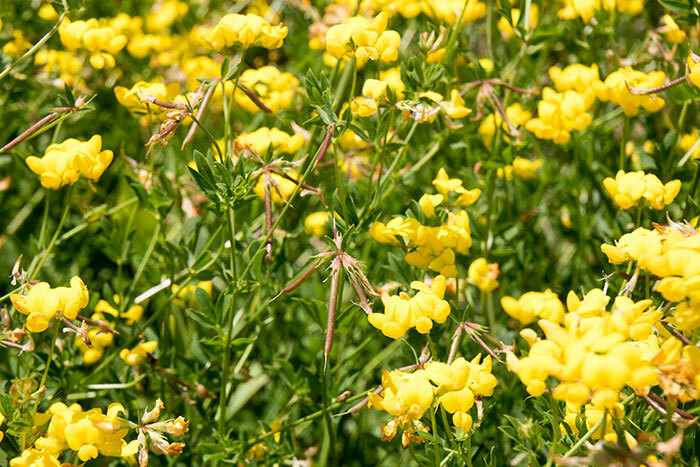 Some might even consider the word “forbs” and “weeds” to be interchangeable. 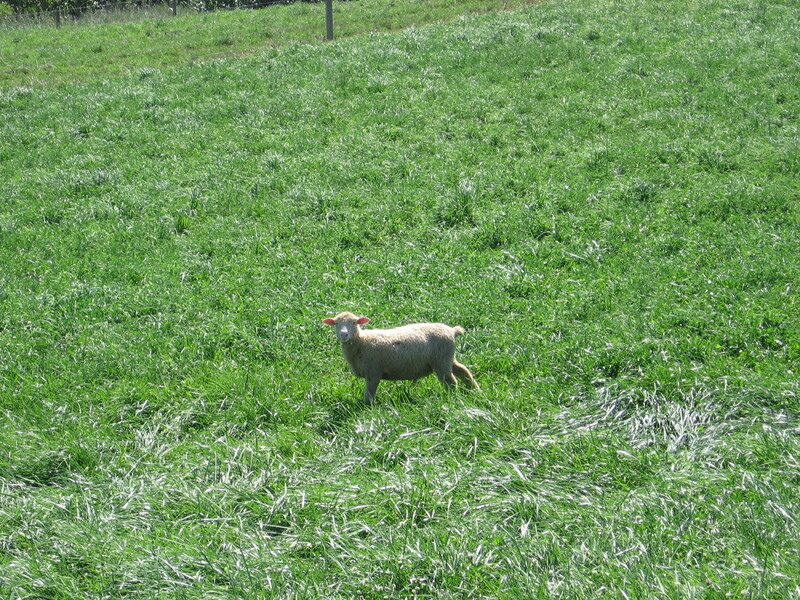 Either way, pasture growth will usually translate to livestock gain when properly managed. Even with Forages, the End of the Year is the Time to Plan! The month of December is a great time to plan. We still have the opportunity to make changes to the 2017 year and plan for 2018. When I think of 2017, especially as it relates to forages, two things come to mind for me. First, what worked and what went wrong? Next, is there anything that can be done to improve the operation for this and next year? What worked and what went wrong? The verdict is in. 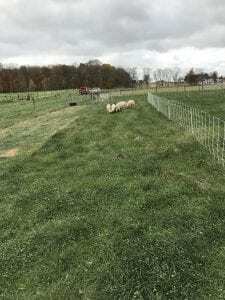 Grazing toxic fescue to the ground is dangerous to pastured livestock. 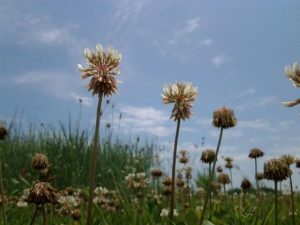 Findings released by the University of Missouri indicate that the highest levels of toxic alkaloids are held in the bottom 2 inches of infected grass. Sarah Kenyon, an MU extension agronomist based in West Plains, Mo., documented these findings in her Ph.D. dissertation. Do you have leftover fair goats, or inherited some that did not make weight at the fair? 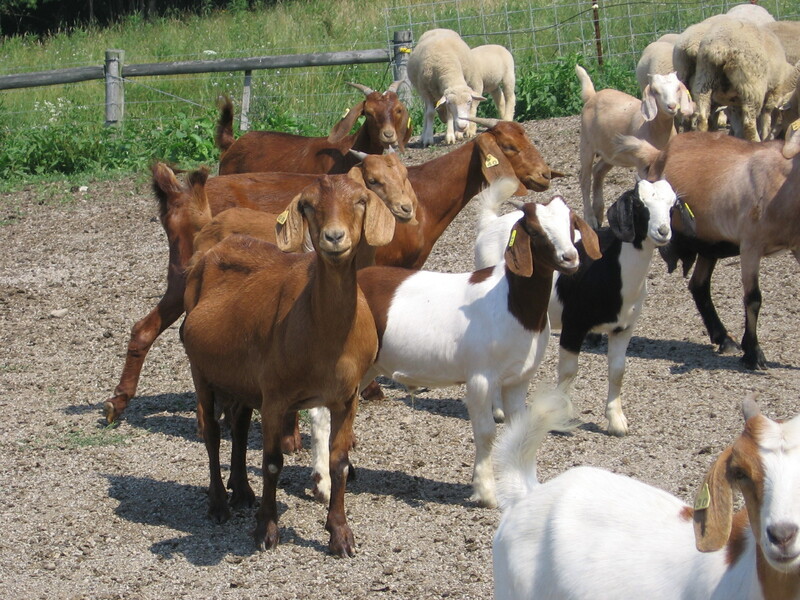 Perhaps your kids or grandkids have been bugging you for the small ruminant animal for some time. Or by chance, did you come into a small herd recently? If so, then don’t perceive goat ownership as a chore or inconvenience but rather embrace it, think positive, and start letting the goats work for you. Although this information has been posted in the past, as harvest has come and gone, this opportunity may serve as a viable option for those looking for a cheap feed source to graze the mature ewe flock on. This strategy allows farmers to optimize on losses associated with harvest as well as serve as a means to save on winter feedings. 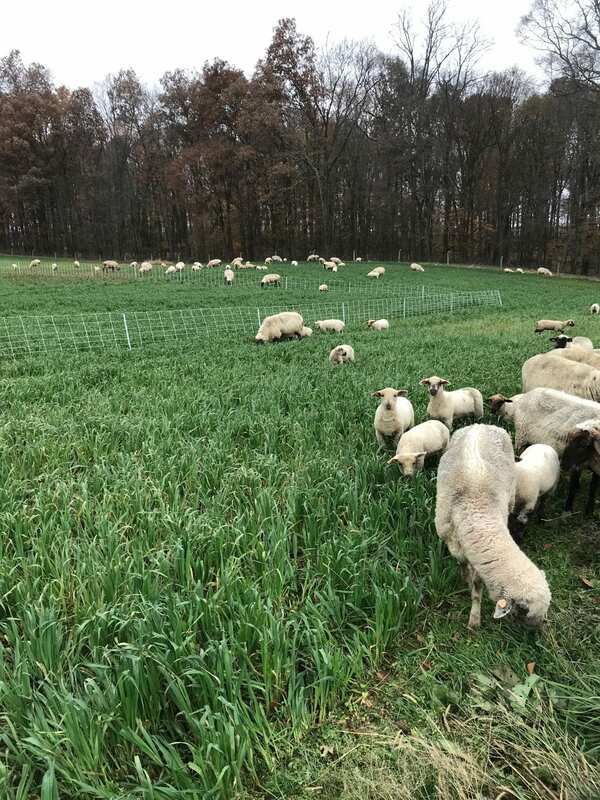 While multispecies grazing may seem like a no-brainer from an economic and sustainability standpoint, these benefits do not always come easily. The added care and management of an additional species is only one added hassle associated with this profitable, yet challenging undertaking. Cook asked successful land managers what they most struggle with and then compiled a list of top challenges for multispecies grazing. Planned paddocks, good fencing, improved forages, grazing management, pasture fertility, and livestock genetics are all important elements when maximizing a grazing system. Water distribution, however, is arguably one of the most important elements of pasture-based livestock systems. Pasture water system needs vary based on livestock species, availability of electricity, soils, water supply needed, and travel distance to water. Water systems should be developed based on individual farm resources, as each farm is unique. 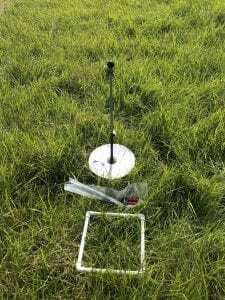 Regardless of livestock species, it is important to test your forages. When in doubt, test them out! Across most of Ohio, 2017 has been a challenging crop year, especially for those in the hay production business. In 2016, while most producers did not have significant yields, quality was tremendous due to the dry weather which allowed for highly manageable cutting intervals and easy dry down. Since the end of June, however, 2017 has been just the opposite, with mother nature forcing many bales to be made at higher than optimal moisture levels, and cutting intervals measured in months rather than days. 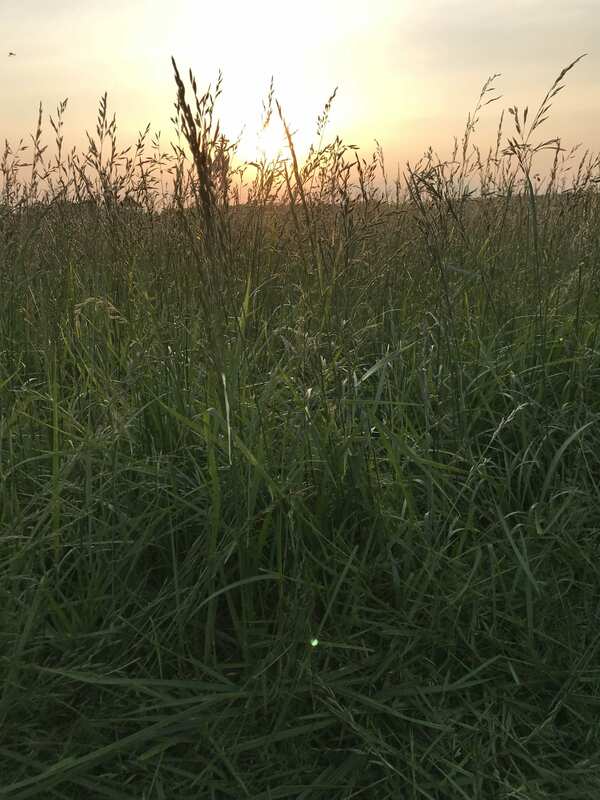 With adequate moisture throughout most of the state for much of the summer, this equates to substantial yields, which in turn for the beef producer, means hay is readily available at reasonable prices. However, for the astute cattleman that either makes his/her own hay or knows the nature of the business, this also means high quality hay may just be the proverbial needle in the haystack, and for the most part, as the old adage goes, you get what you pay for. In Ohio it is possible to graze year round. Of course grazing in winter does take planning. Summer is the best time to plan for fall and winter grazing. Why? Because many of our options have tasks associated with them in summer. 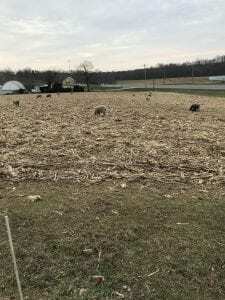 By planning ahead it is possible in Ohio to have adequate quality, grazable forage for most of the winter. Depending on the class of livestock and their stage of production it is possible to need to feed for weeks in winter as opposed to months. For those that are interested in the basics of parasitic resistance and a quick overview of how to manage parasites on-farm, view the video below. This is a great resource for all producers raising grazing livestock. 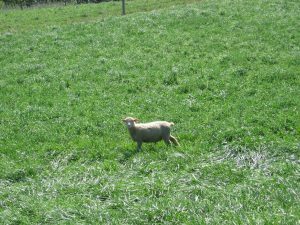 Can the implementation of growth promotants or forage grazed finishing diets increase lean muscle gain in lambs without increasing carcass fat? Marketing lambs at a high lean to fat carcass ratio is important in producing consistent and quality retail lamb products. 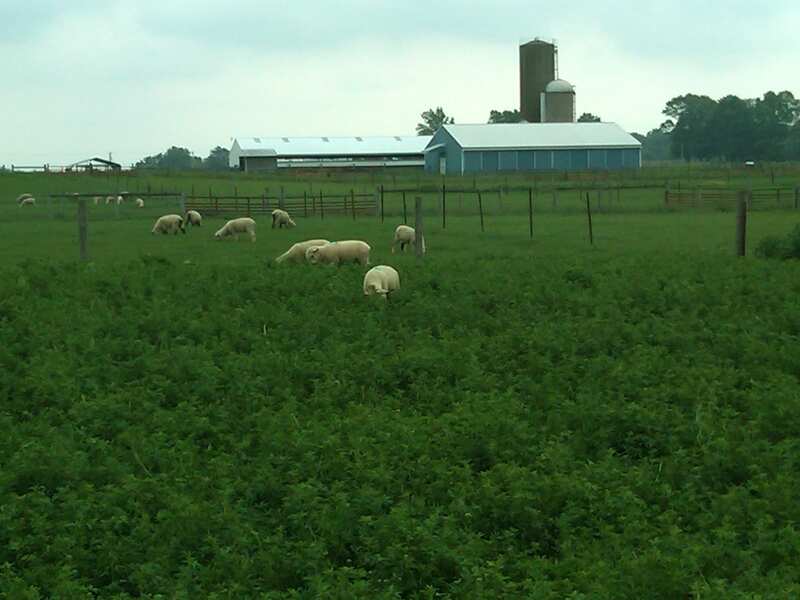 Recent storms downed many trees throughout Ohio and some of these pose a threat to livestock. 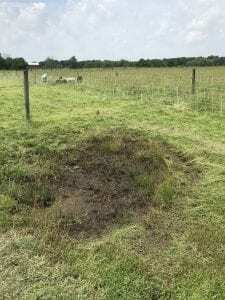 Poisoning is most common when grazing is scarce, such as periods of dry weather coupled with thunderstorms that down trees during the mid to late summer months. As I have driven around the county the past few weeks, I have noticed some patches of poison hemlock on roadside banks and also in some fields. 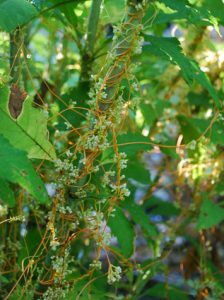 This is a concern because all parts of this plant including leaves, stems and roots are poisonous when ingested. This is a good time to scout both hay fields and pastures for this weed and take steps to control it. This is not a weed that livestock owners can afford to ignore. While most plants are beneficial, some are hazardous to animal and human life. 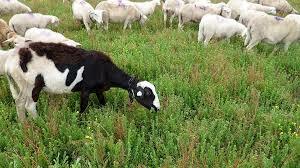 Ohio has about 100 toxic plants and some of these are responsible for deaths of domestic livestock every year. The number of cases of toxicosis (plant poisoning) in livestock far outweighs those reported for humans. Accurate statistics are not available, but it is estimated that several thousand animals die annually in the U.S. from plant toxicosis. 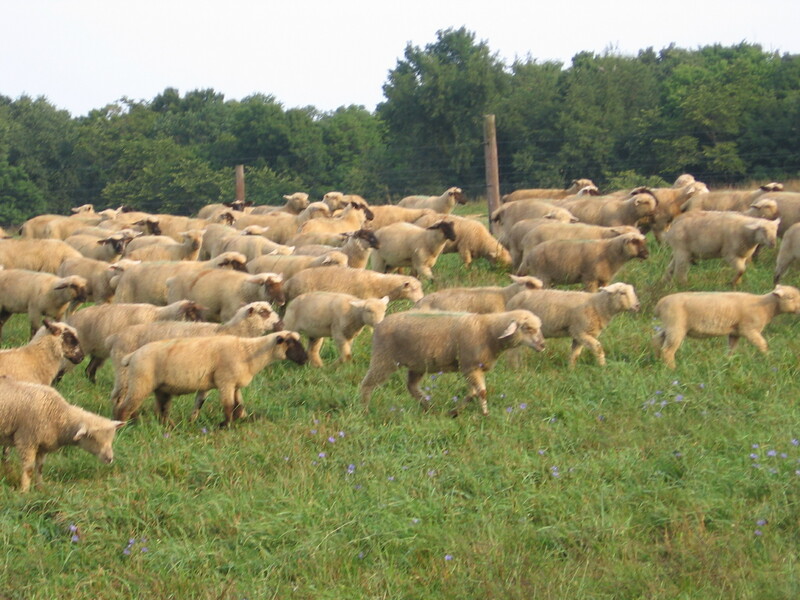 May through early June is generally a time of good pasture growth and corresponding livestock production. However, if you are grazing sheep and goats this is the time of year that needs careful consideration in regards to internal parasites, in particular Haemonchus contortus, the barber pole worm. 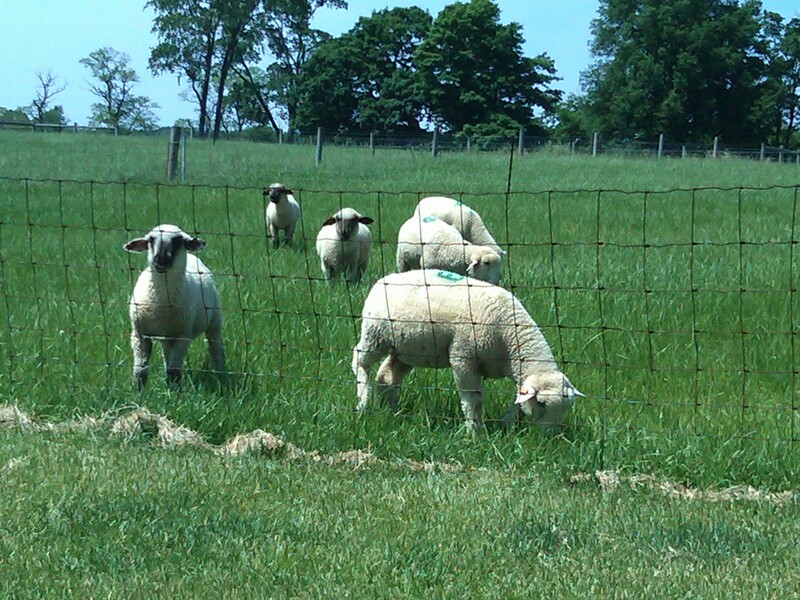 One way to approach this grazing season is to think in terms of risk management. Early spring provides us with a window of opportunity to get a new forage stand established. The actual success in getting that new seeding established depends upon several factors including: soil fertility, species selection, weed control, timing of planting, planting depth, post planting management. Let’s look at each factor in a little more detail. 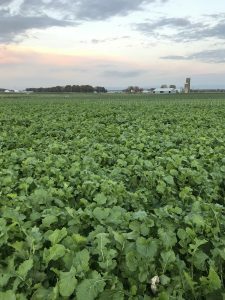 As you looked across your pasture and hay fields this past September you may have noticed not only were the surrounding trees turning fall colors, but your red clover and alfalfa were also showing colors of fall? But this is not a color of fall we like to see especially in our red clover and alfalfa. 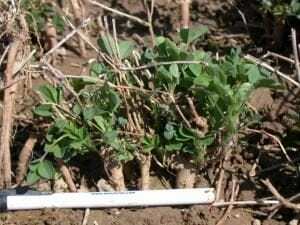 Yellow or orange threadlike stems were reported in red clover and alfalfa fields in several western Ohio counties in September. 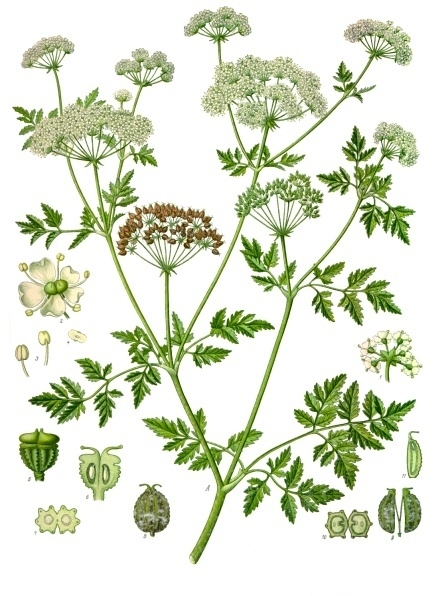 The stems are stringlike, twining, smooth and branching to form dense masses in some fields. 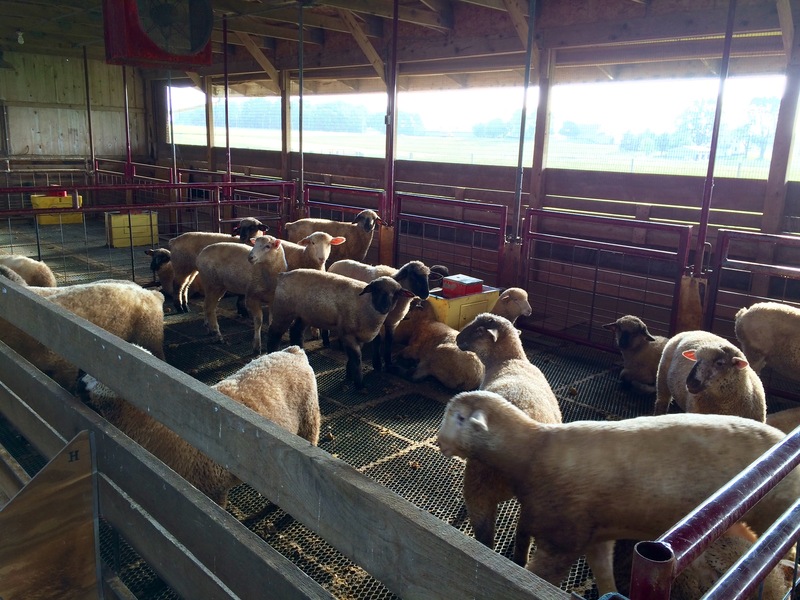 Parasite Management for Small Ruminants Begins… in the Fall? 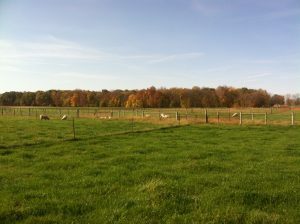 Fall is one of the most crucial time periods for our cool season pastures. 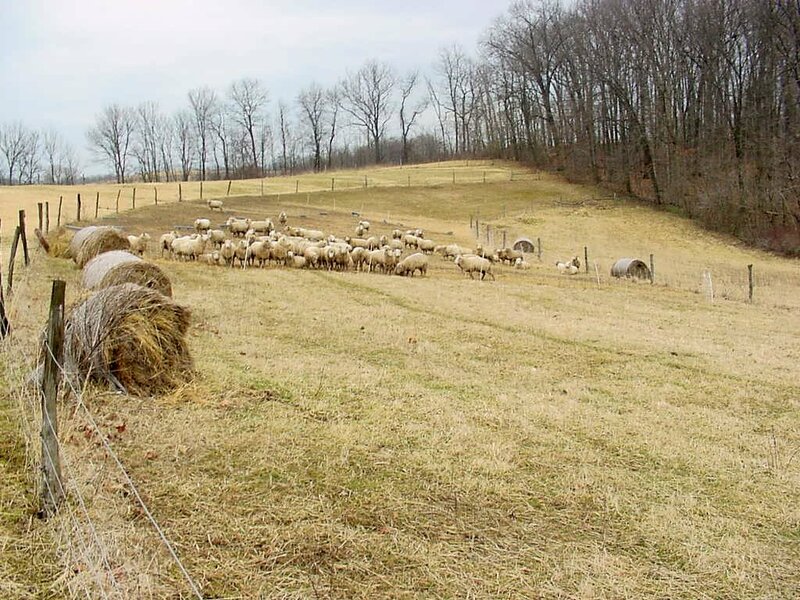 The most important activity a livestock producer should be doing to help the pastures survive winter and remain productive next year is to avoid over-grazing. Oats, Planted Late, Continue to be Our Most Dependable Forage?!?! 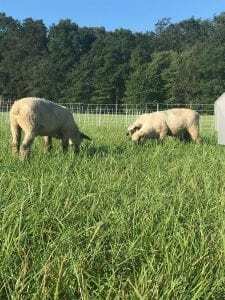 Most know that for the past seven years, we’ve spent much time in Fairfield County investigating the virtues of oats as an annual forage when they are planted during mid to late summer, or even into early fall. 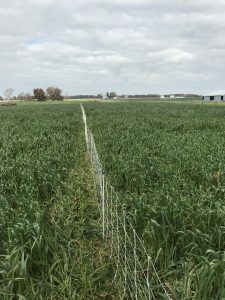 While we’ve harvested from 2 to 5 tons, and consistently realized average yields of 3+ tons of dry matter from oats planted in July and August after a harvested wheat crop, it’s also apparent that yield and quality can vary greatly as planting date, nitrogen fertilization, and perhaps even oat varieties differ from each field planted. 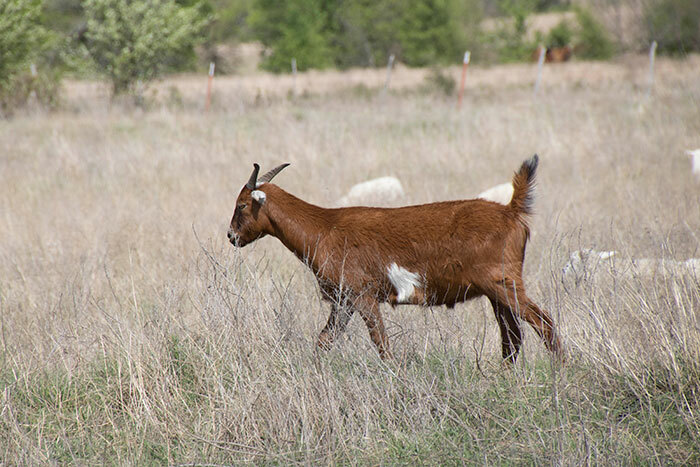 The experienced grazier knows that how grass pastures are managed in the fall of the year determines what they have to manage in the spring of the year. While we tend to think of fall as bringing an end to pasture growth, it turns out that this is a critical time for the grass plant. 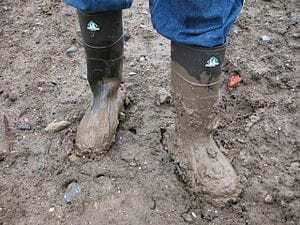 Fall is an excellent time to complete several pasture related tasks. 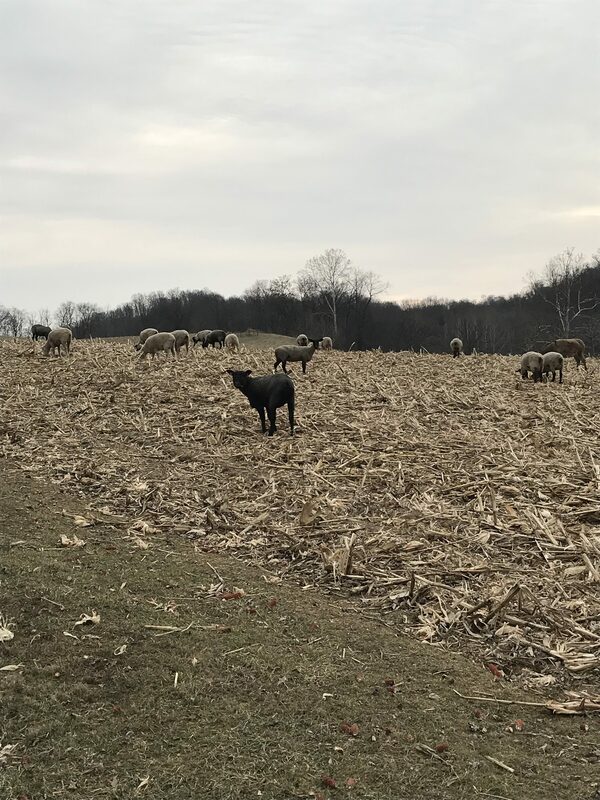 There are activities a livestock producer should be doing to help the pastures survive winter and remain productive next year. 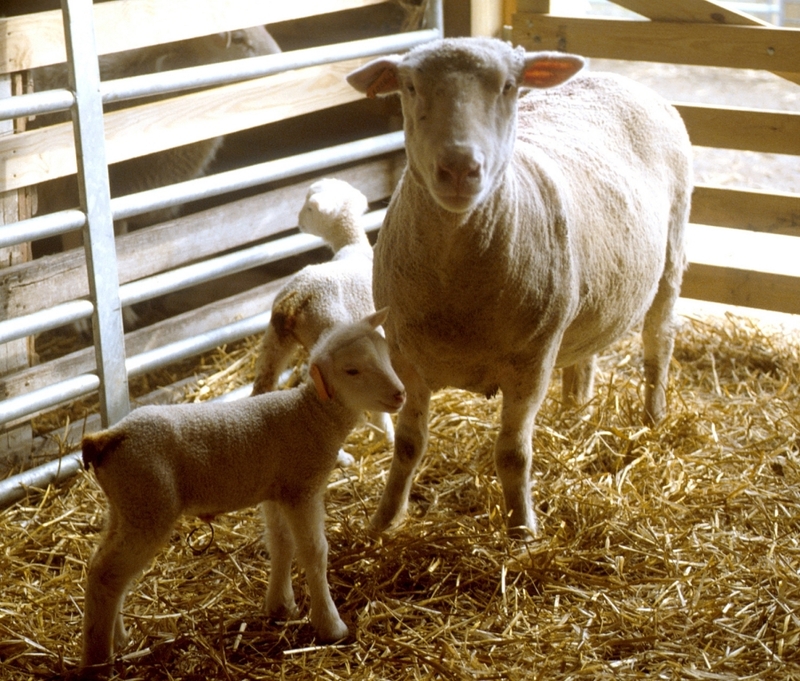 What is lambing like, for your sheep flock, hours per lamb or lambs per hour? The shepherd’s labor and the size of the lambing barn are the two things that limit the size of most Ohio sheep flocks. 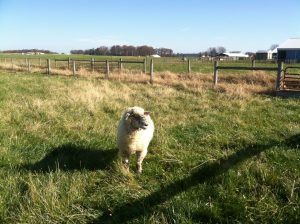 Pasture-lambing avoids both of these concerns. 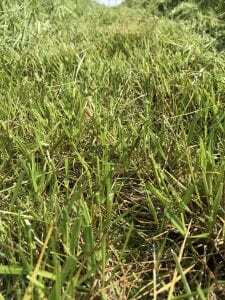 Sudangrass, Could it Work for You?